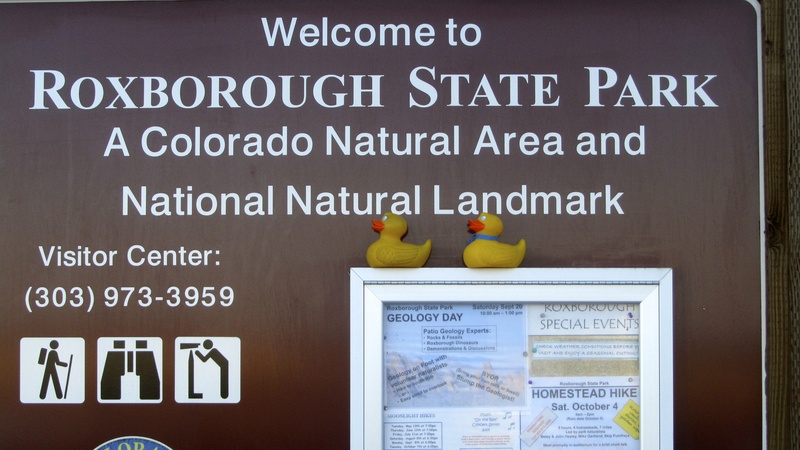 I, Zeb the Duck, Soapy Smith Duck, our moms and Soapy’s dog Stevie went to Denver’s Oktoberfest. A really great festival! We watched the keg bowling. This man pushes the keg with wheels down the road trying to knock down the empty kegs at the end. He did pretty well, too. 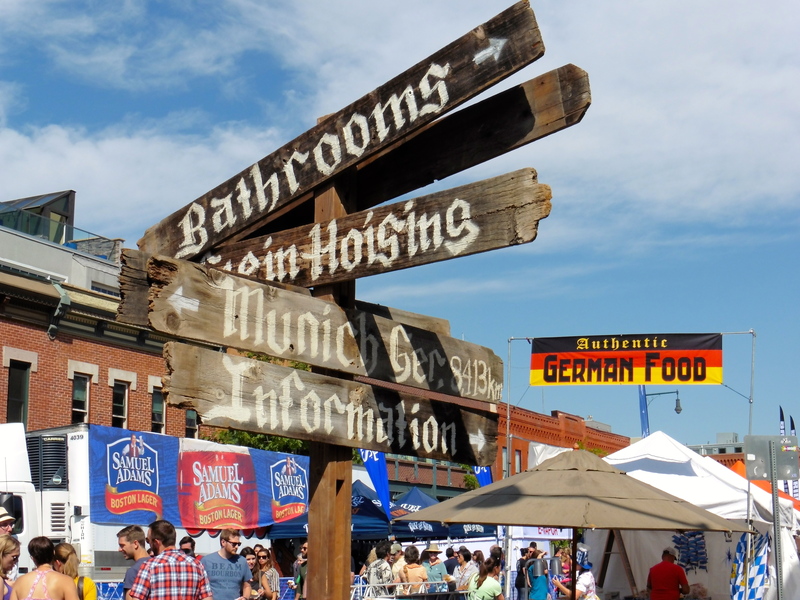 Look at these great signs put up especially for this festival. Now we can find things. There were a lot of people here and everybody seemed to enjoy this accordion music. 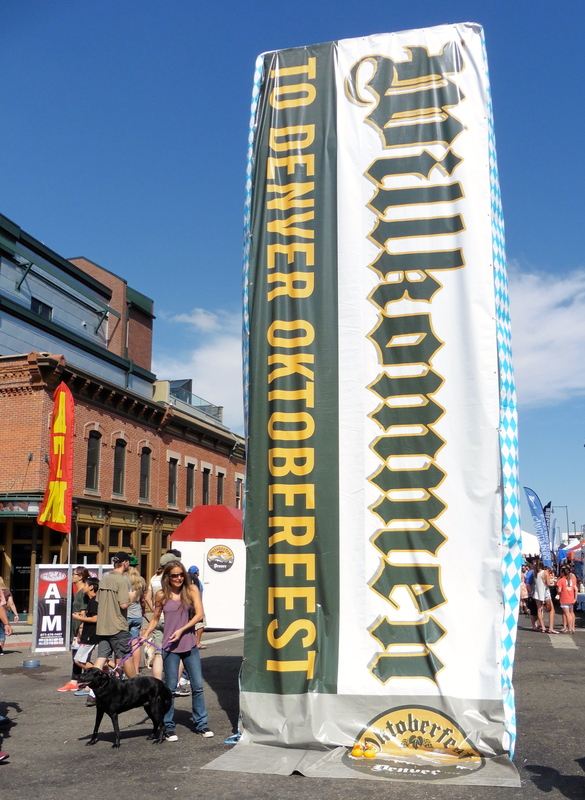 After 2 weekends of festivities, Sunday was the last day of Denver’s Oktoberfest. 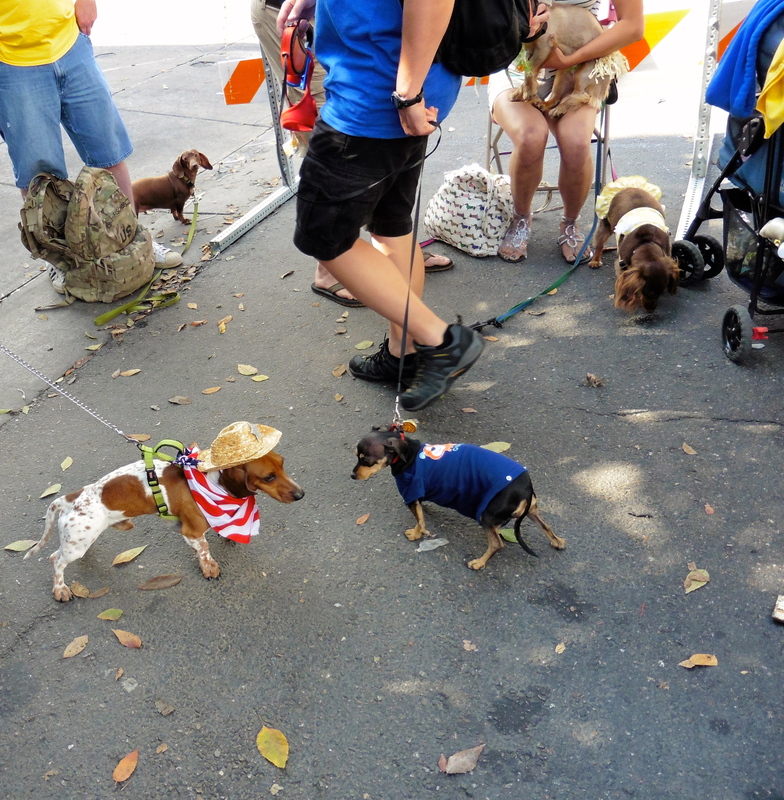 And the day featured the German wiener dogs. 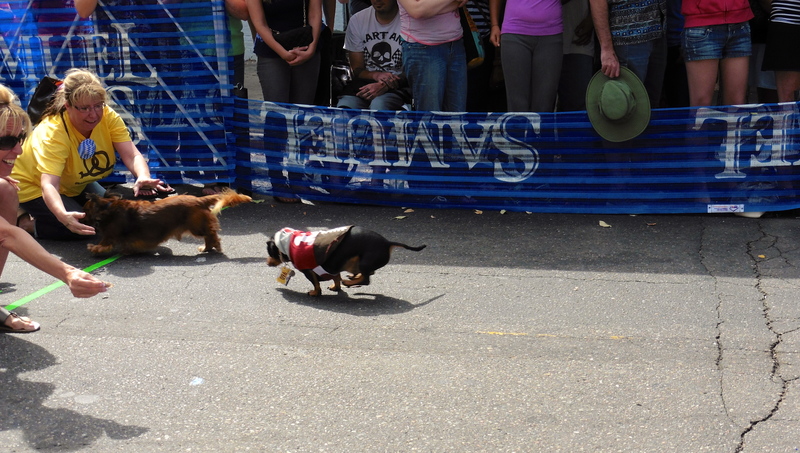 There was the Long Dog Derby. 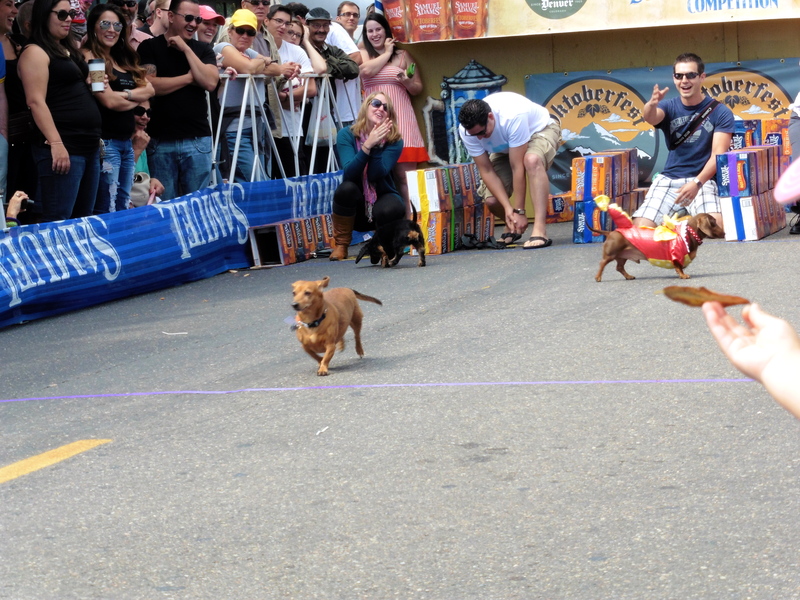 This is a wiener dog race. 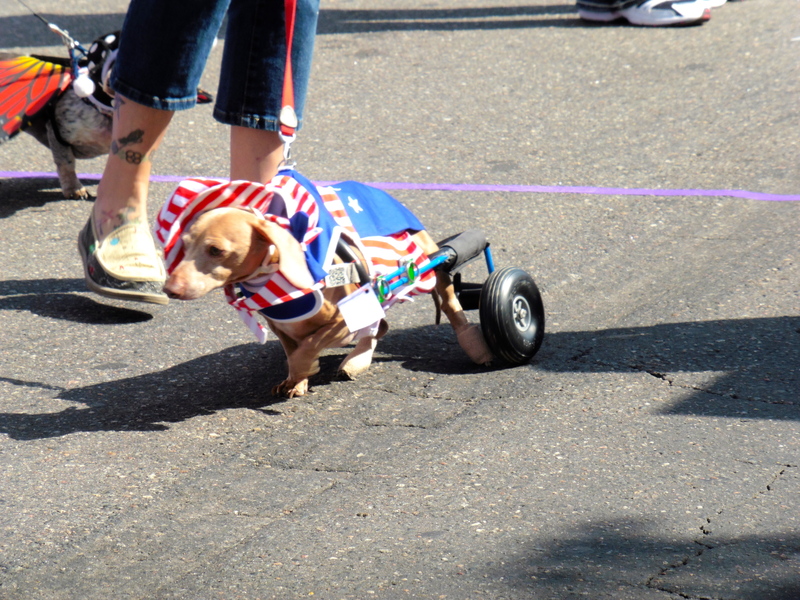 The dogs were divided into categories based on age and also a category for those with disabilities, such a cart for legs. 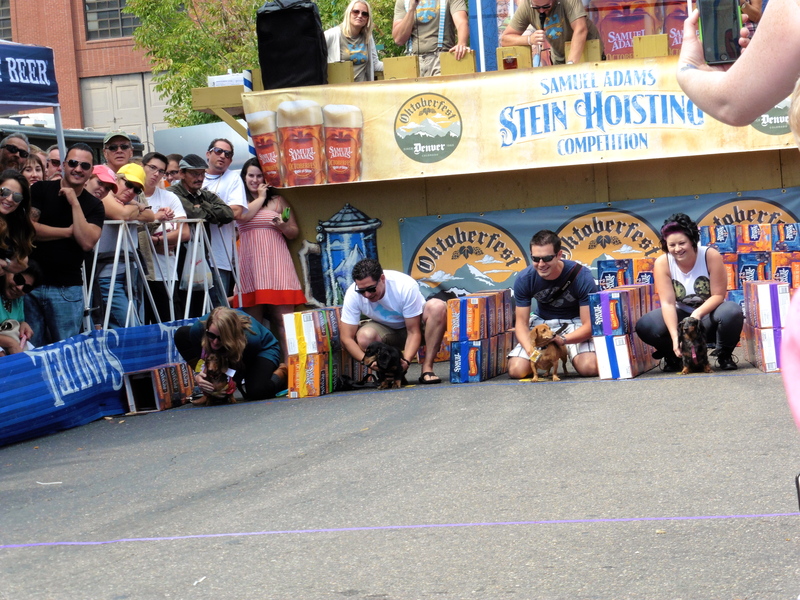 One owner holds the dog at the starting gate. Then the countdown and the dogs begin to race. but watching the crowd also. 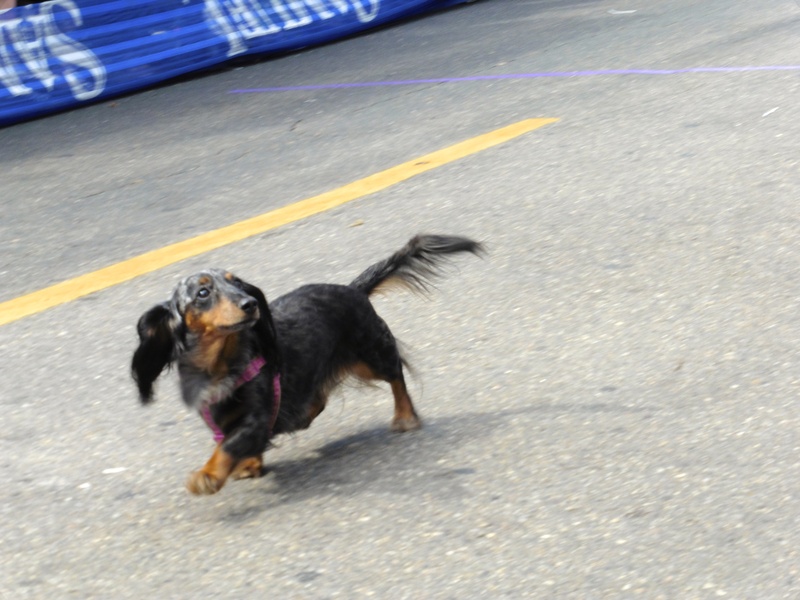 Another human is at the finish line urging the dogs to run faster and reach the finish line quickly. 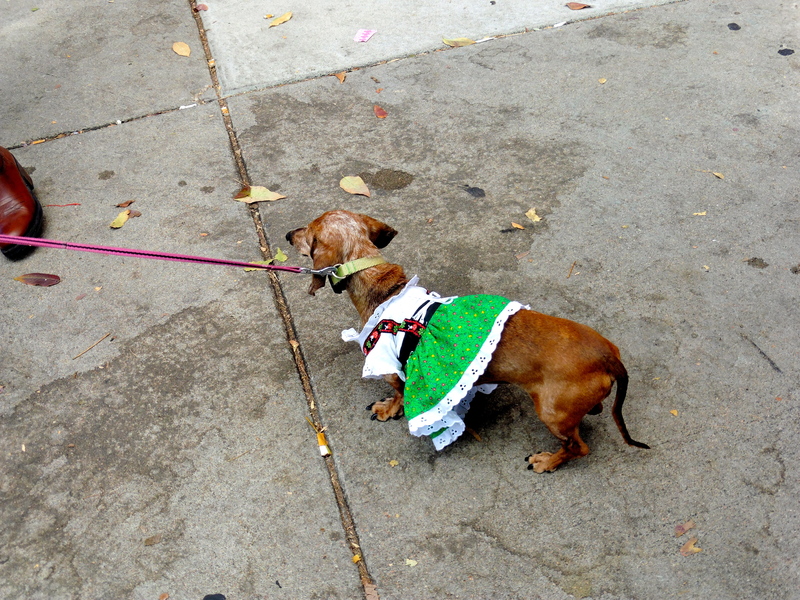 Many of the dogs wore costumes. 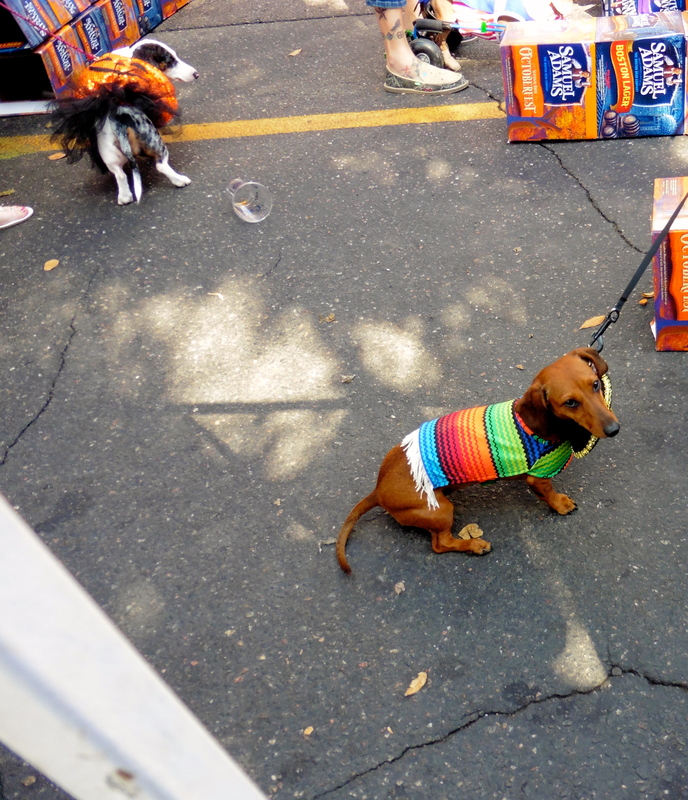 Here are just a few of the many adorable dogs we saw. Click on any photo to enlarge it. 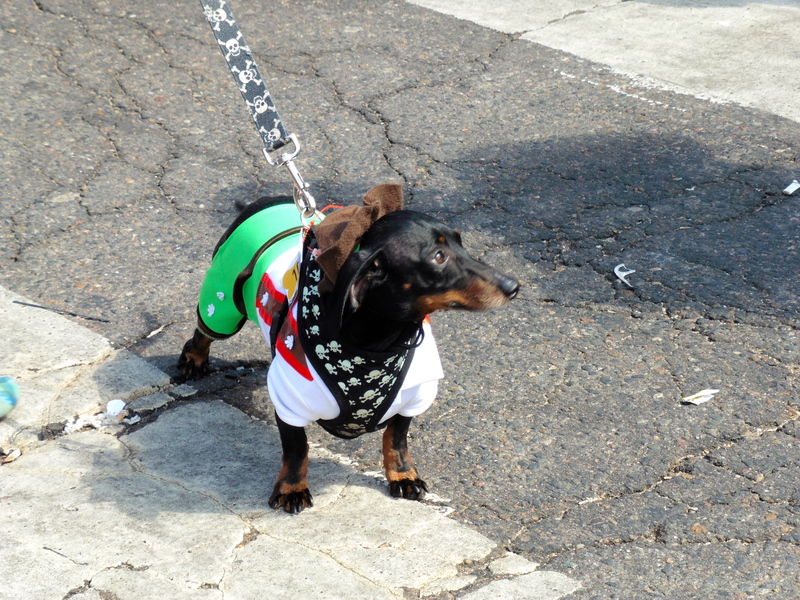 This dog, with a jockey on his back, won the costume contest. 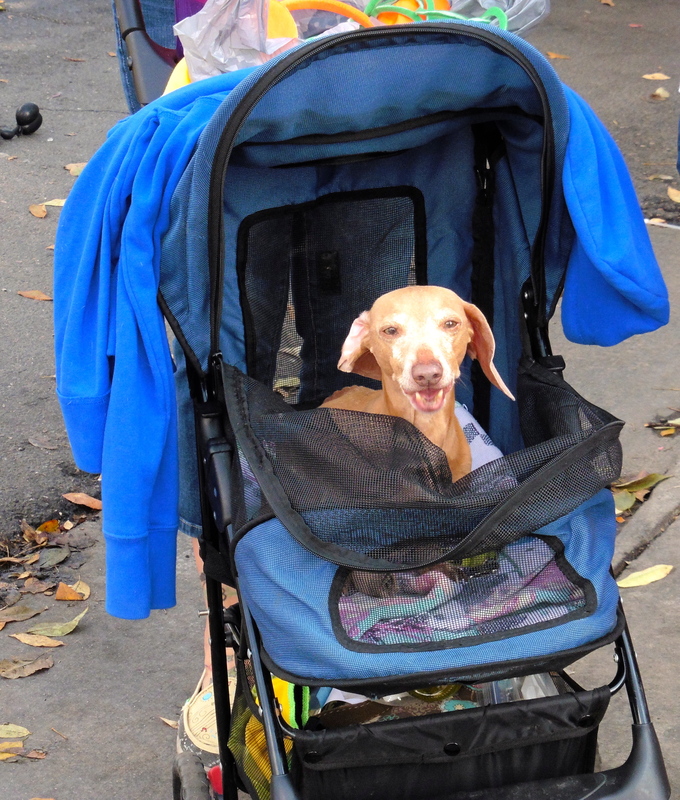 This guy was just too tired to walk further. They do have short legs. We saw, and smelled, wonderful food. 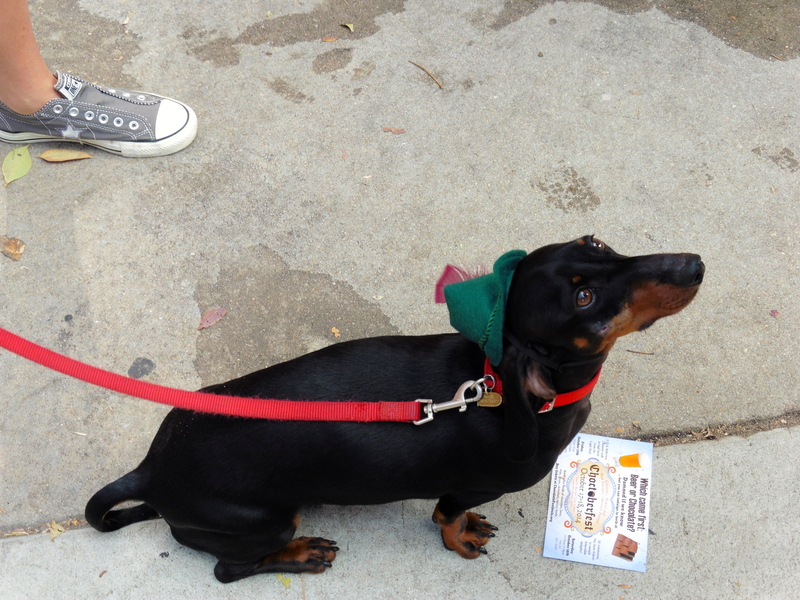 There were trays of strudel, hundreds of brats, hot dogs, schnitzel, and those wonderful large soft German pretzels. 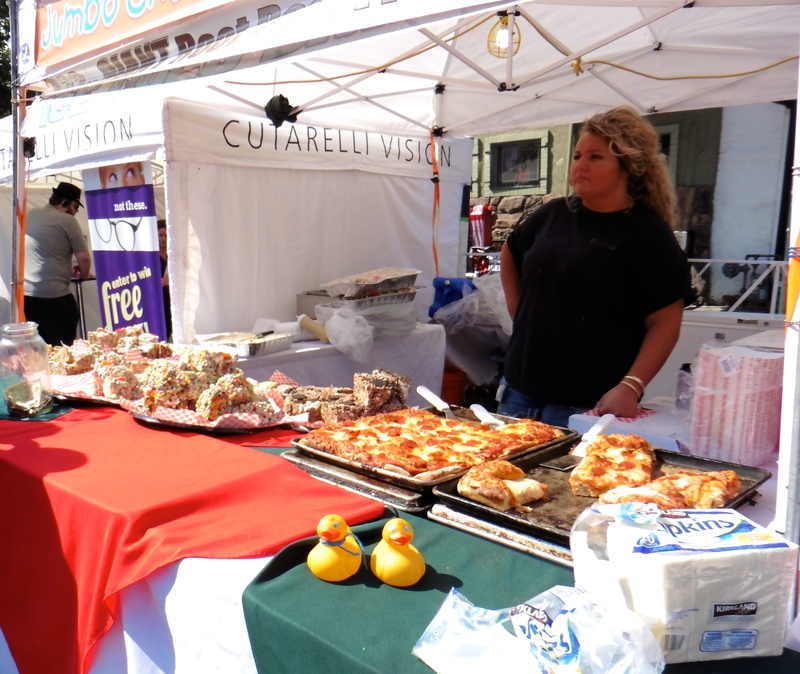 Look at this pizza and those huge pieces of Rice Krispie candy. This food is ready to eat! 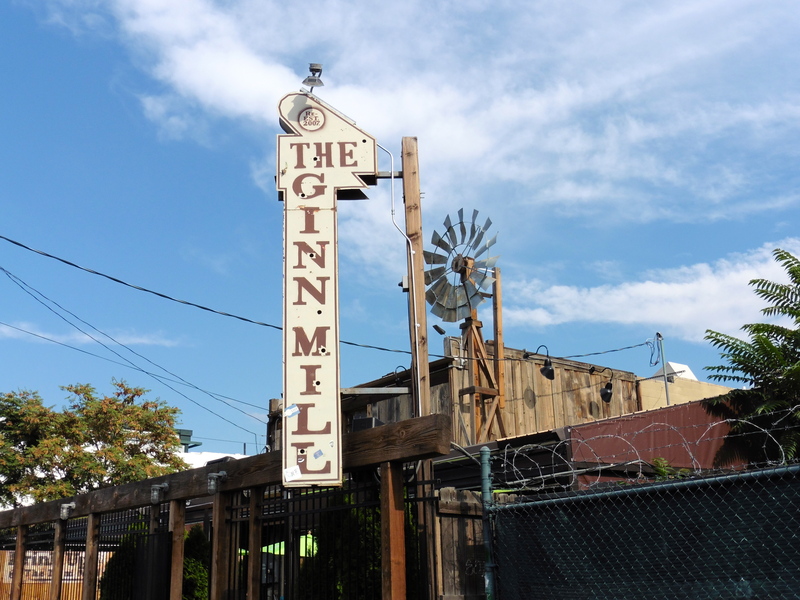 Our moms took us to the Ginn Mill. 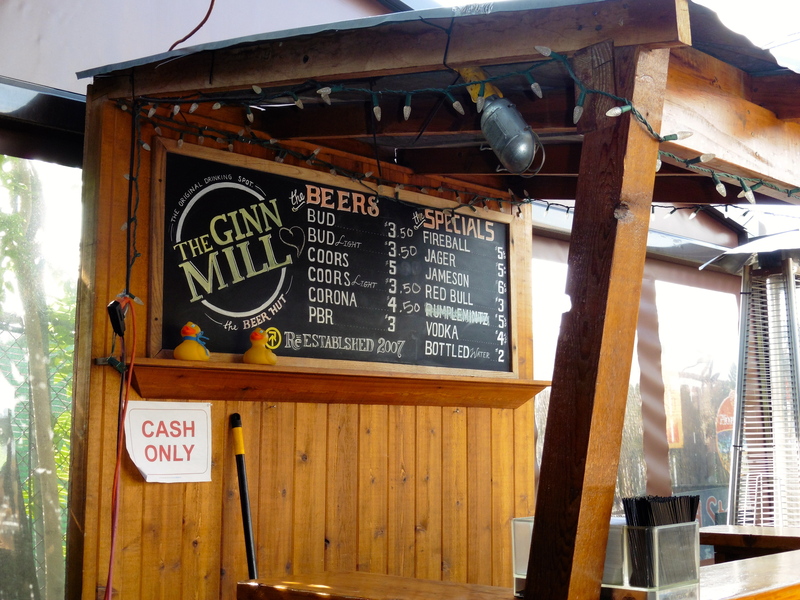 We could take our street food inside, order drinks and eat inside. 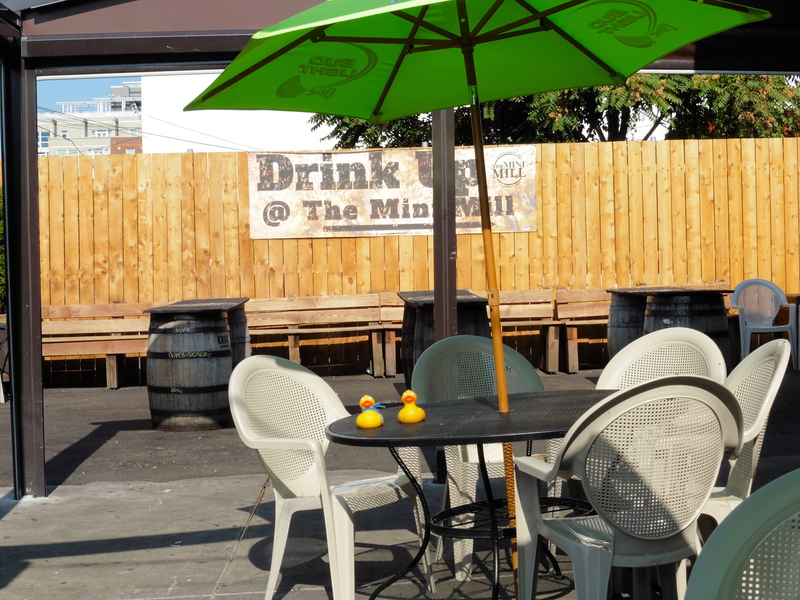 We went to their covered patio to enjoy food and drink. And, they let Soapy’s dog Stevie come in with us. She ate some of our food and had her own bowl of cold water. This was a great day for us. 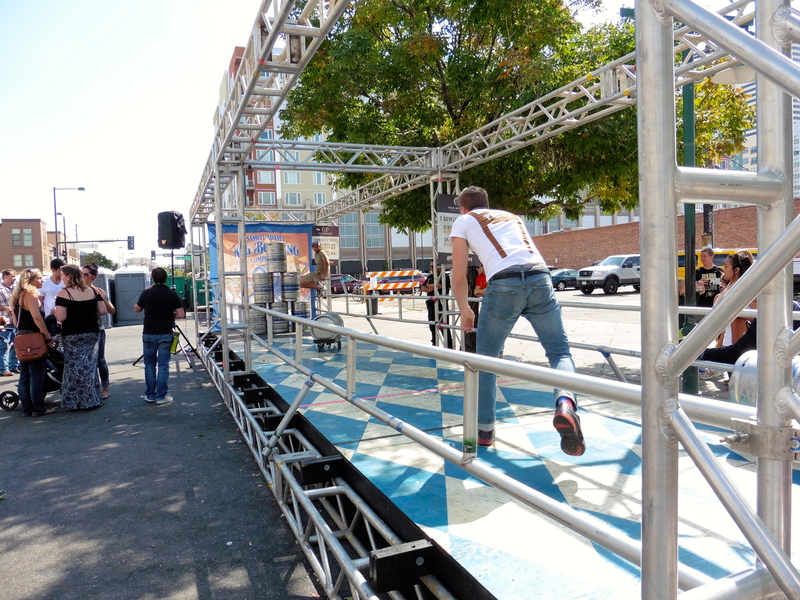 Don’t wait too long to attend a festival near you. Summer is over and soon we may see snow and cold weather. We enjoy being outside when we can and hope you do too. Western Colorado is beautiful. 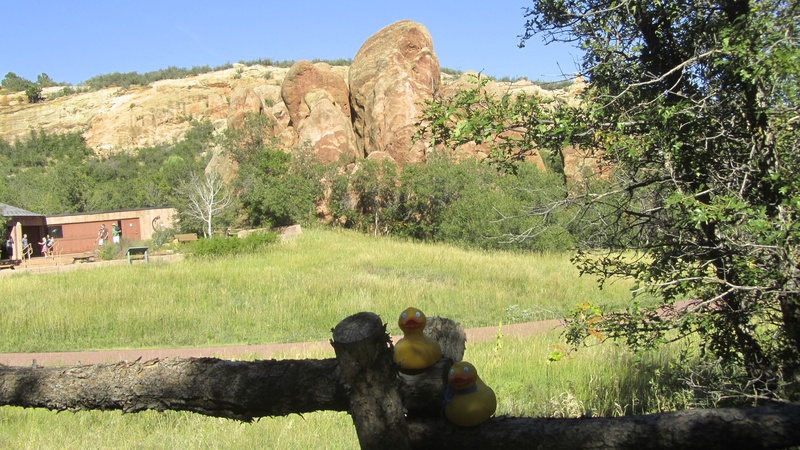 Mom, Soapy Smith Duck and I, Zeb the Duck, drove to Redstone, Colorado. Redstone is on the Crystal River. Yesterday we showed you the coke ovens and today we will show you the town. 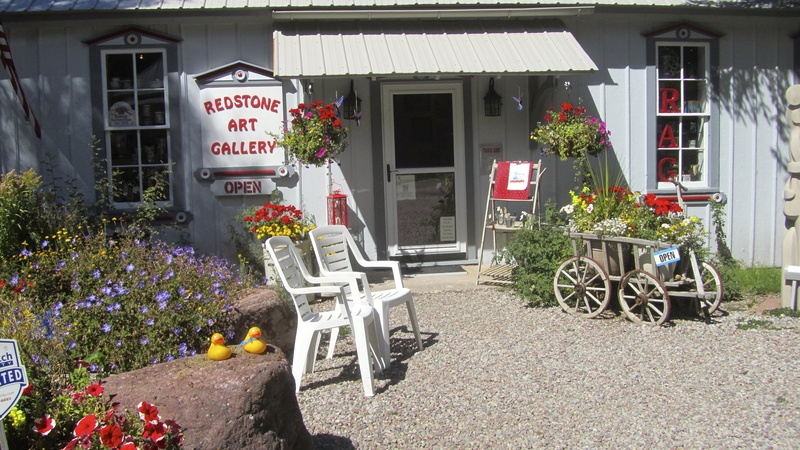 We went into town and had to stop at the Redstone Art Gallery. Look at these items of wood. This is Natural Top Tamarisk Burl with some turquoise. Richard Fitzgerald created them. We love wood. This oil painting, Fall River Refuge, was my favorite. 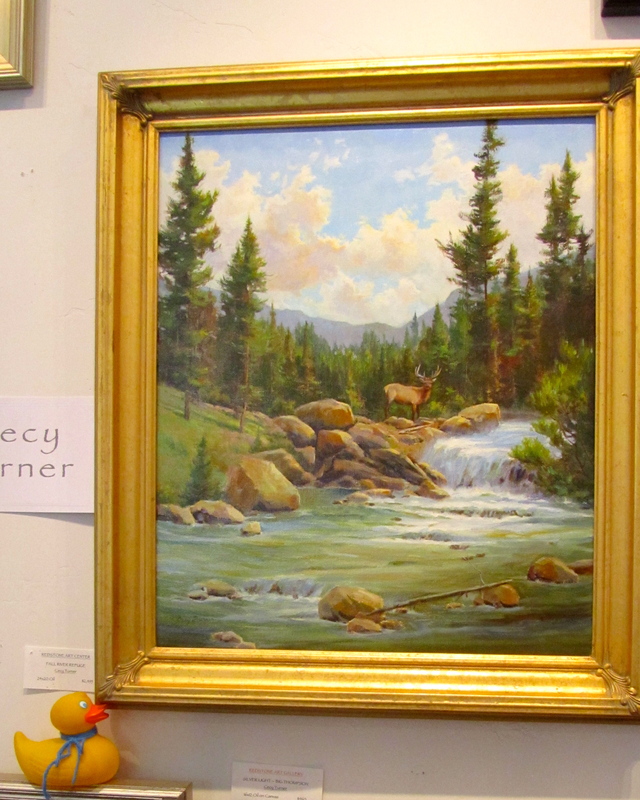 Cecy Turner painted this one. 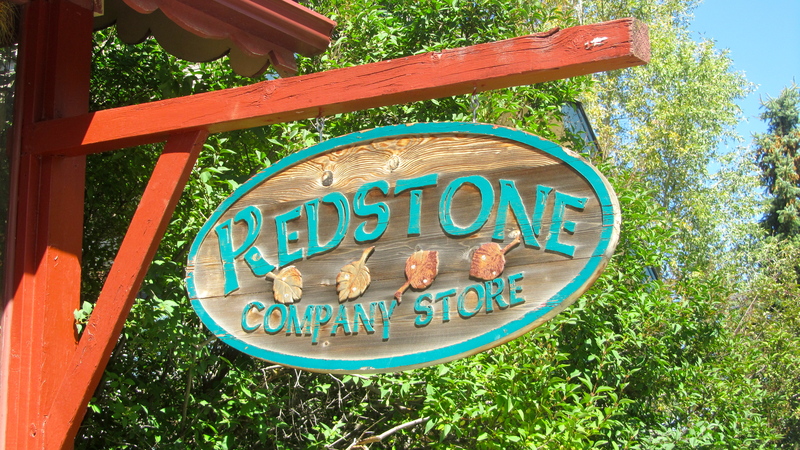 Redstone is a great town for tourists and residents. We saw hotels and this house was available. The back yard reaches to the Crystal River. What a great place to live. 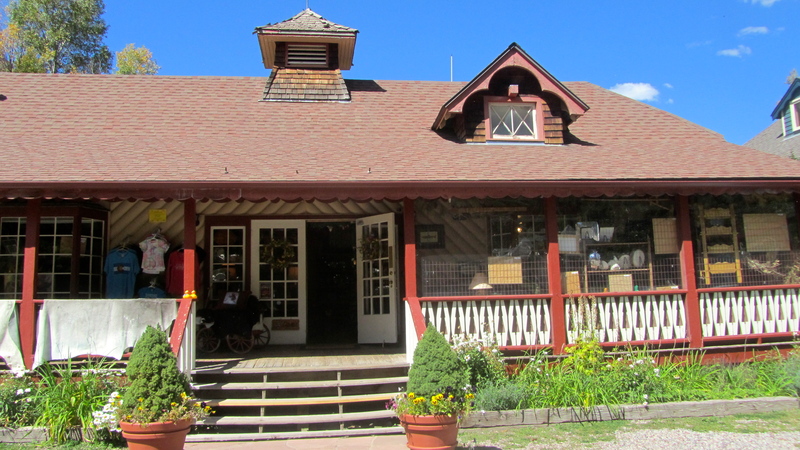 Then we saw the company store. This store looks more like a large home. We like Redstone. 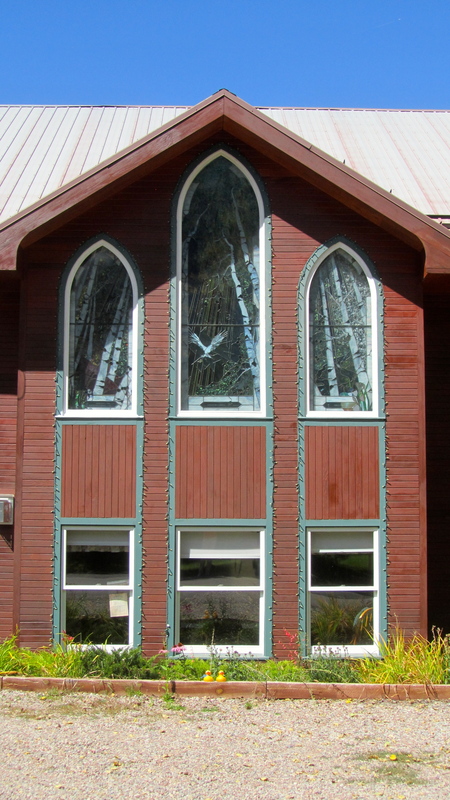 Walking through town, the windows in the Church at Redstone sure got our attention. 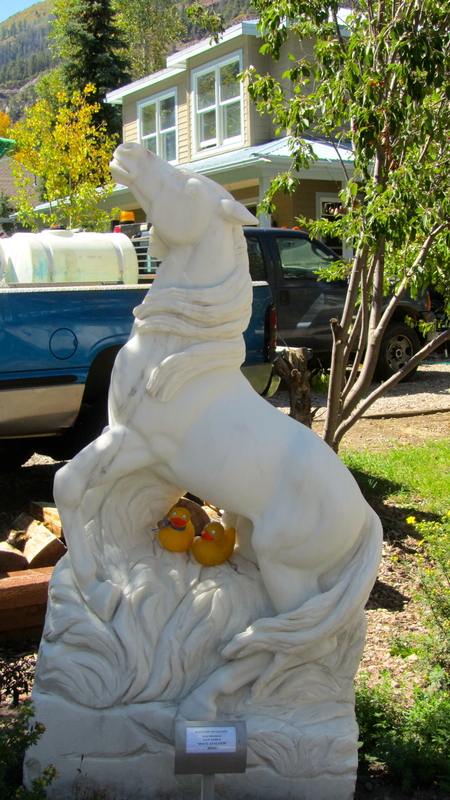 White Stallion, by Vicki Branson, is sculpted from beautiful Colorado marble. 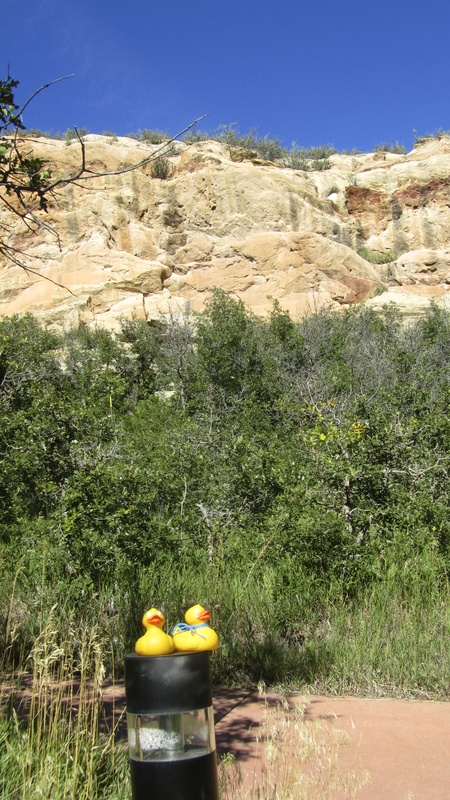 This marble is from the nearby Yule Marble mine in Marble, Colorado. 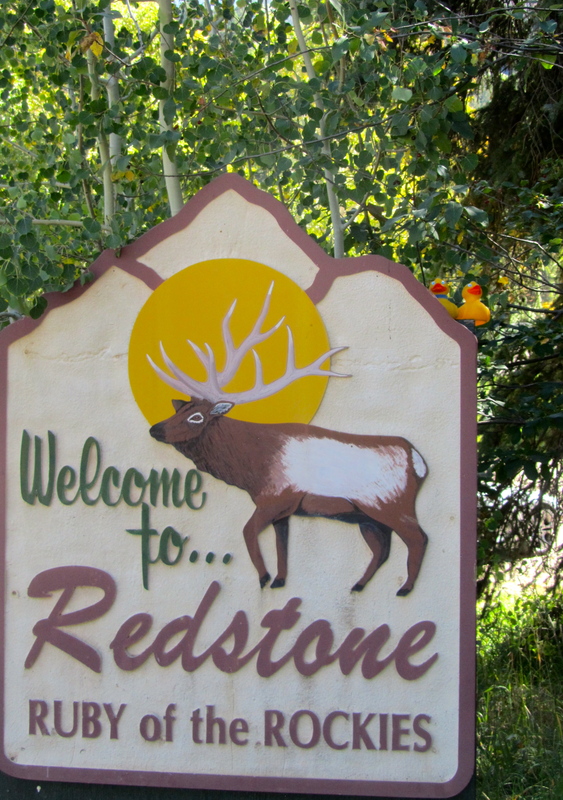 Redstone, Colorado is a little south of Glenwood Springs, in the once isolated Crystal Valley, on the Crystal River. The mountains are spectacular. This road through town is leaving the area of the art gallery, hotels and company store. Isn’t this a pretty town? 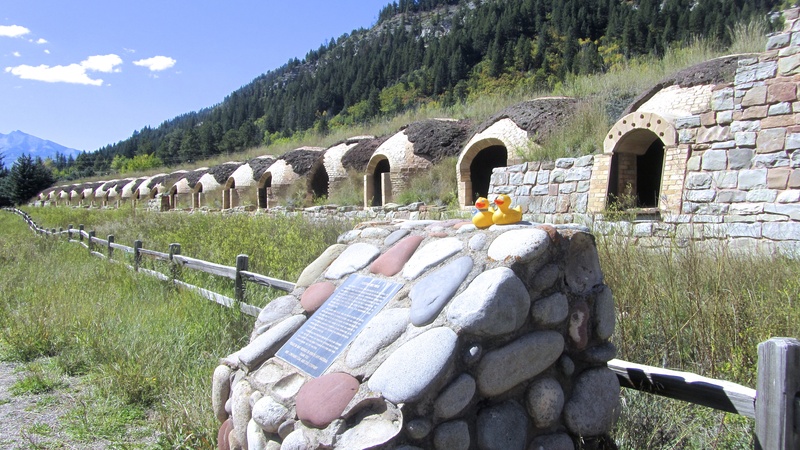 Soapy Smith Duck and I, Zeb the Duck, saw beehive coke ovens at Redstone, Colorado. 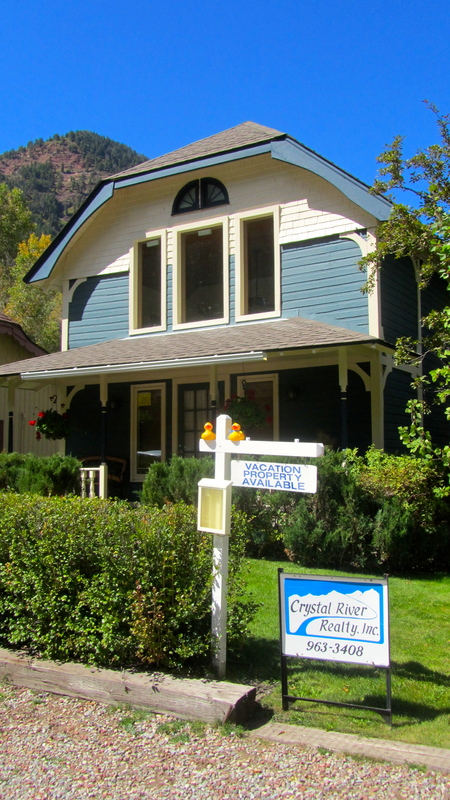 Coal of premium quality was mined in the mountains at an elevation of 10,000 feet and higher. Coal was baked in these coke ovens to produce coke, a more efficient fuel. 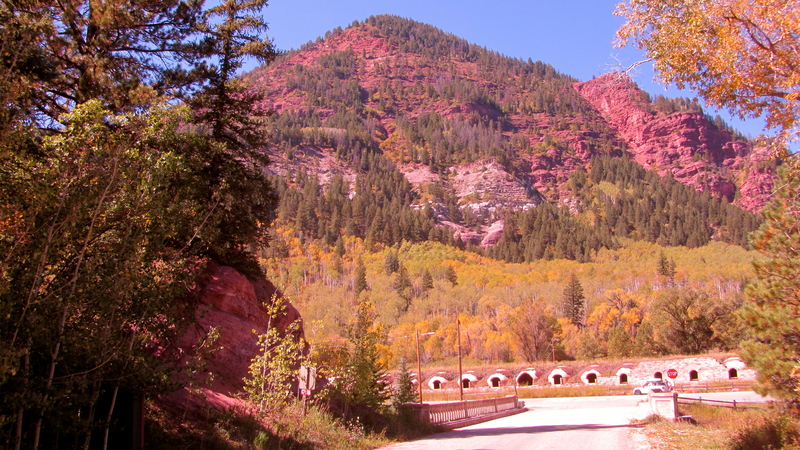 These coke ovens, a few miles from Aspen, Colorado, were built about 1899 and used for 10 years, until the mines closed. At their peak, the 200 ovens were producing almost 6 million tons a year. The idle coke ovens donated their support steel during the scrap metal drives of World War II. According to Wikipedia, later hippies who moved into Redstone used the ovens as living space. Used as hippie housing? We know how Redstone got its name. By the coke ovens we saw this monument. The first paragraph reads: This monument stands in tribute to the miners of Coal Basin, who confronted adversity and proved themselves resourceful, innovative and intrepid. We honor their achievements and their sacrifices, remembering in particular those brave, good men whose lives were lost in the mines. Monument to the miners. A tribute from Mid-Continent Resources, Inc. The plaque explains Colorado Fuel and Iron Company mined approximately 1 million tons of coal from 1900-1909. Then Mid-Continent Resources, Inc. mined approximately 28 million tons of coal between 1956 and 1991. The premium quality and unique properties of the coal were the inducement to mining under difficult conditions, including the high elevation, steep terrain, heavy snows and avalanching on the surface. 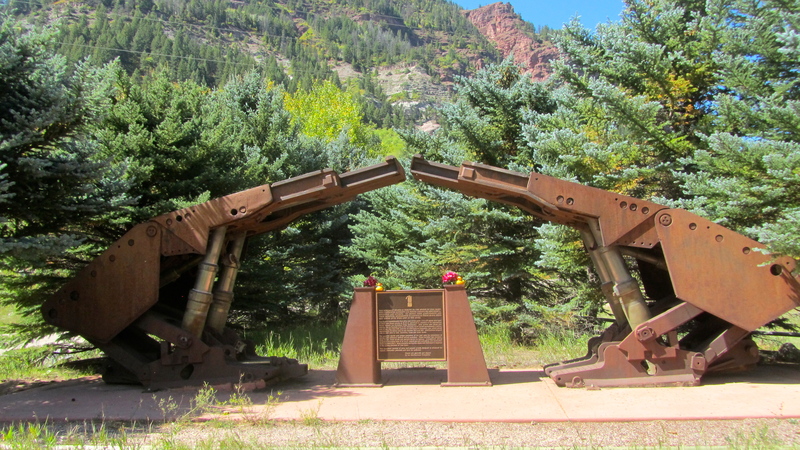 The monument consists of mine roof support shields designed to withstand the massive overburden pressures and mine fan pedestals. This monument was placed here with gratitude and respect by the Mid-Continent Companies. I, Zeb the Duck, did not know about coal in Redstone and I did not know about coke ovens. Perhaps you would enjoy visiting this area also and learn more about the coal mining in Redstone. 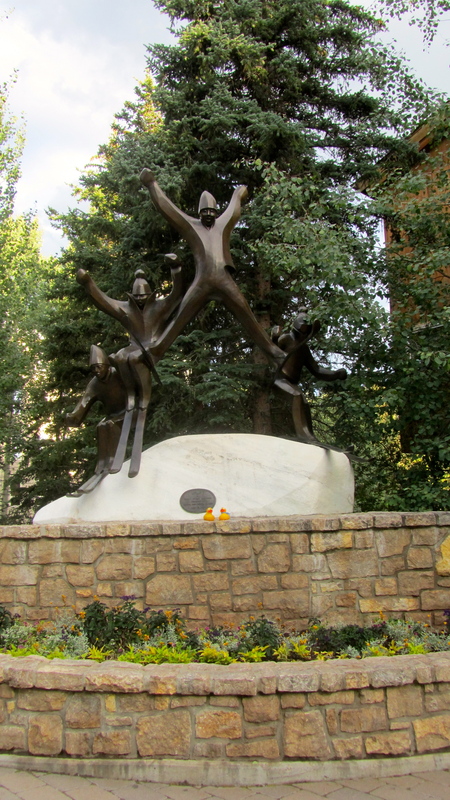 I, Zeb the Duck, and Soapy Smith Duck went to Vail. 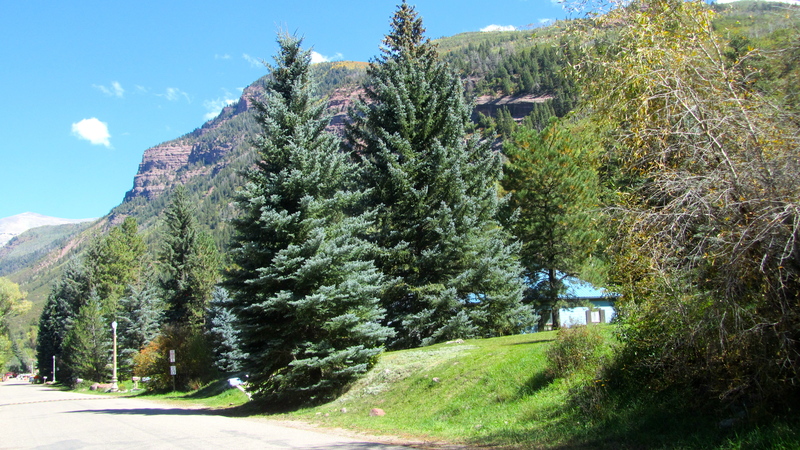 This fantastic ski resort is about 100 miles west of Denver on I-70. We go there for festivals and sometimes just for lunch. 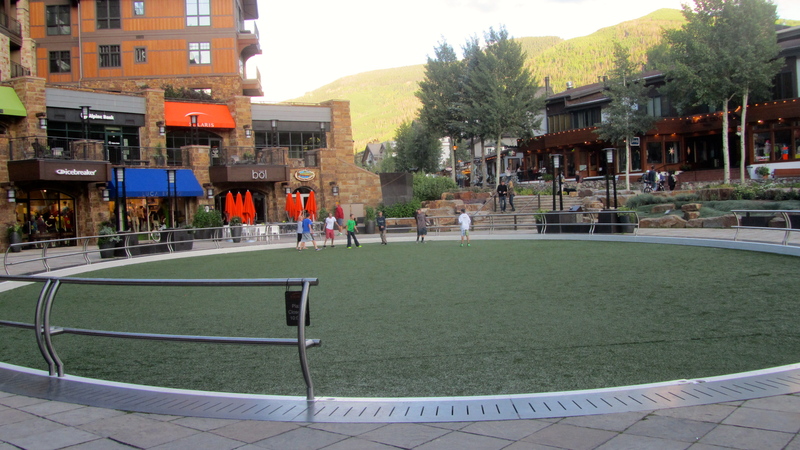 We want to show you a few things that make Vail a great destination. 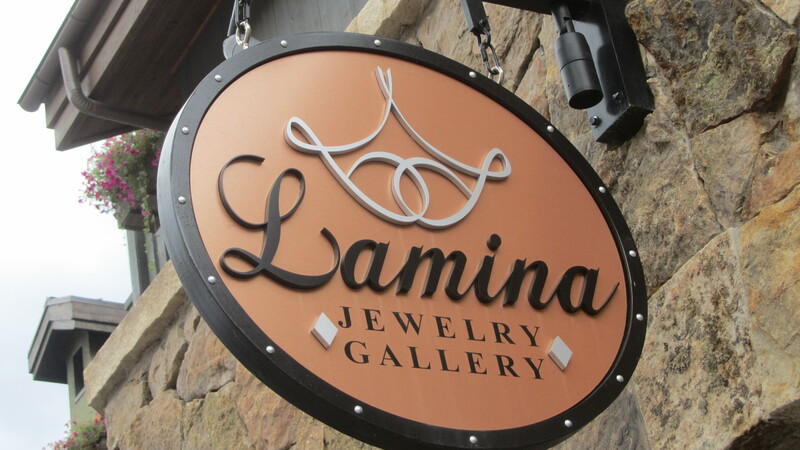 You will find great shopping, including this nice jewelry store. 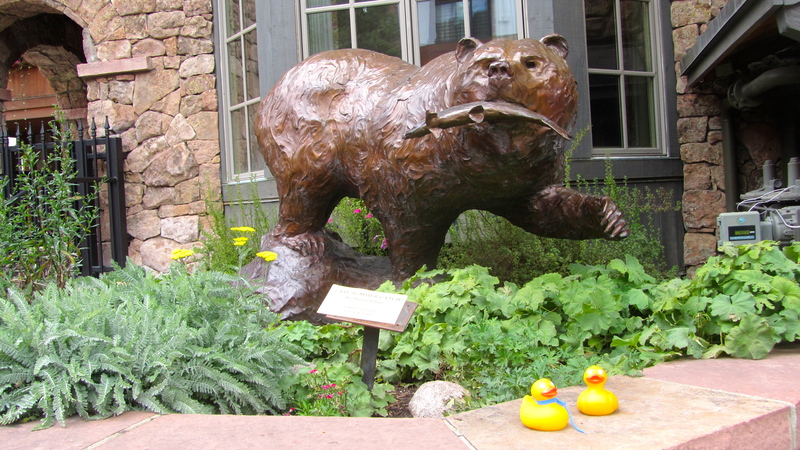 There are many statues in Vail. We love these bears. This bear with a fish is also nice. 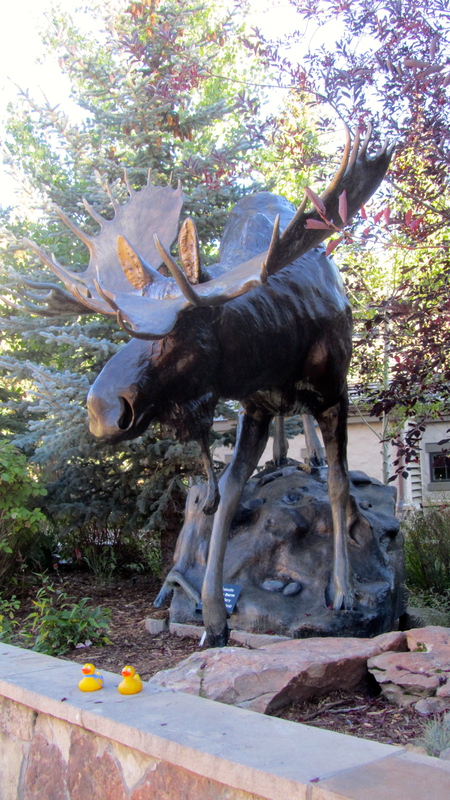 Of course, the Rocky Mountains require a statue of a moose. 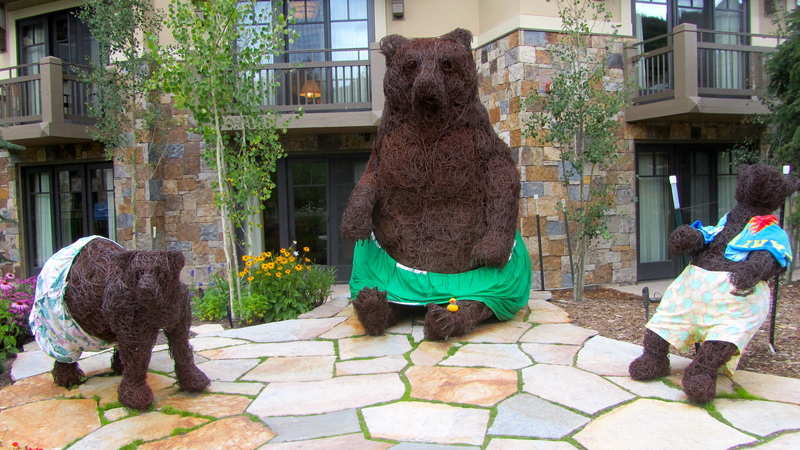 The flowers are beautiful in Vail. 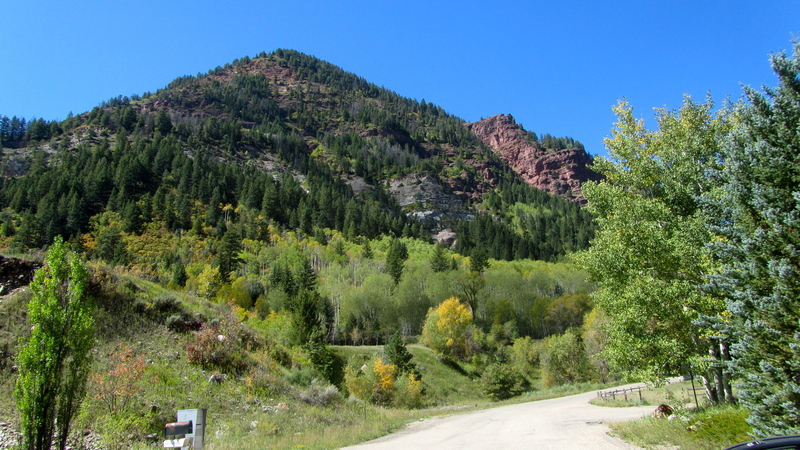 The higher altitude and many daily hours of sunshine enhance the vivid colors. These skiers seem to be having fun. 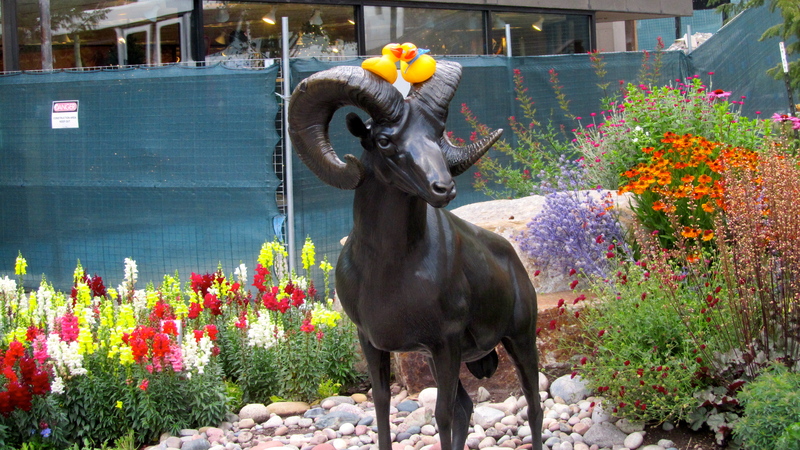 The ram is nice also. 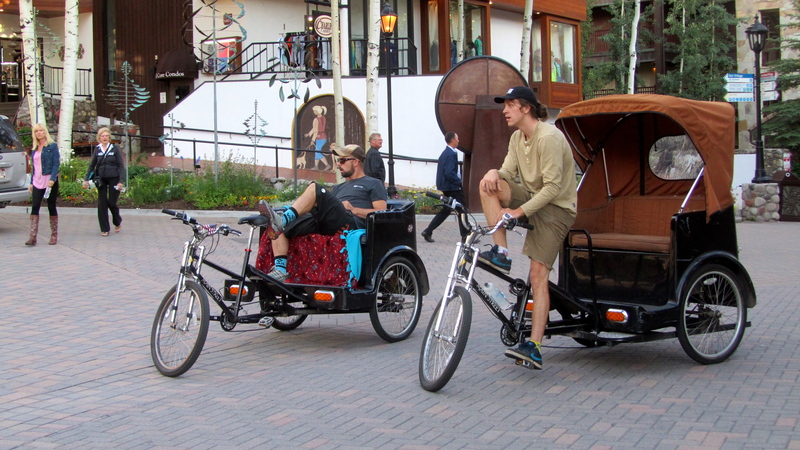 Many of Vail’s streets are pedestrian only, so these Pedi cabs are very convenient. This statue is unique and we like it. This area is for kids to play ball. A very nice addition to the town. 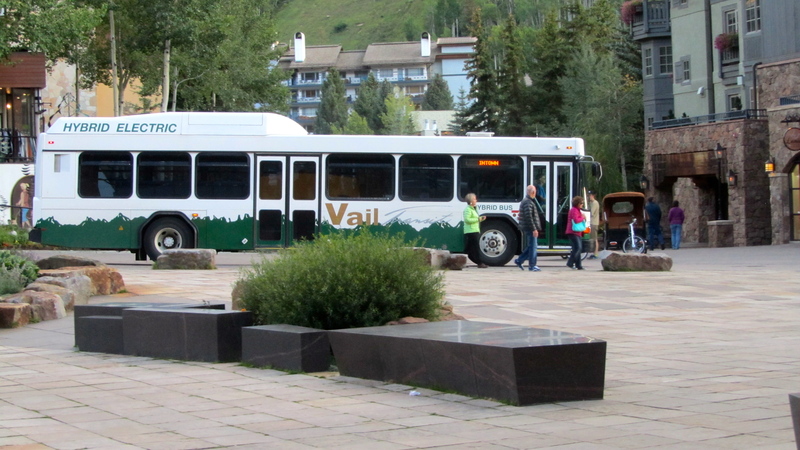 Another way to get around town is the free downtown buses. 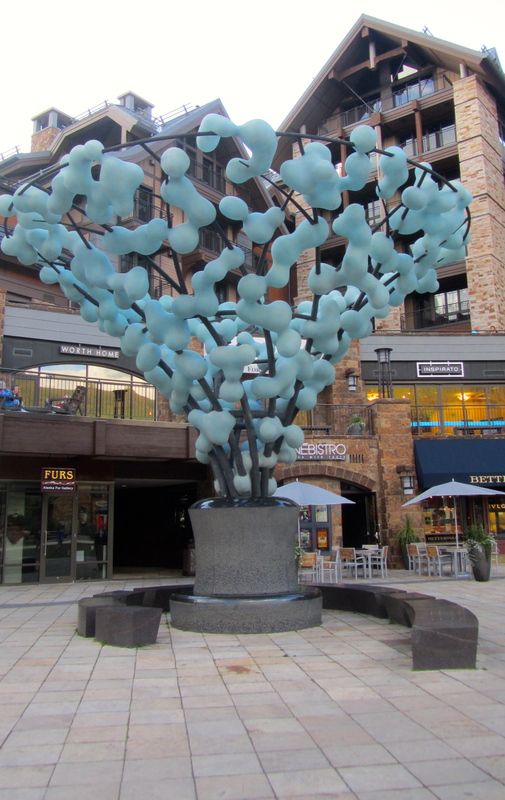 You will want to visit both Vail Village and Lionshead. After so much walking and shopping, it may be time for a drink and light snack. 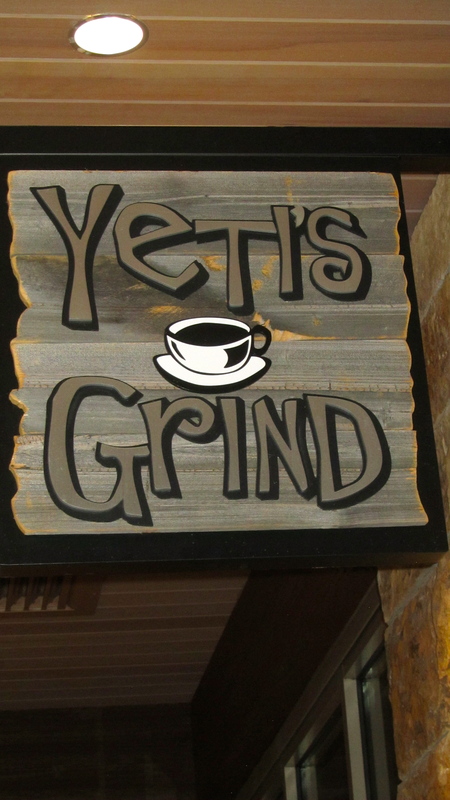 Yeti’s Grind looks like just the spot to visit. 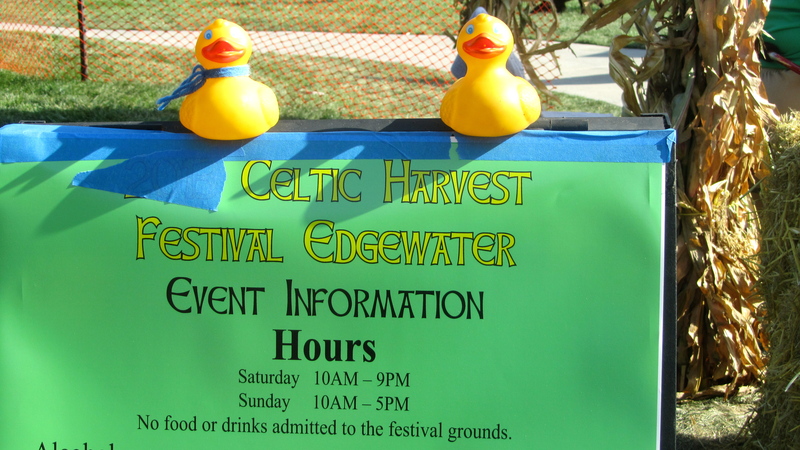 Soapy Smith Duck and I, Zeb the Duck, went to a Celtic Festival. 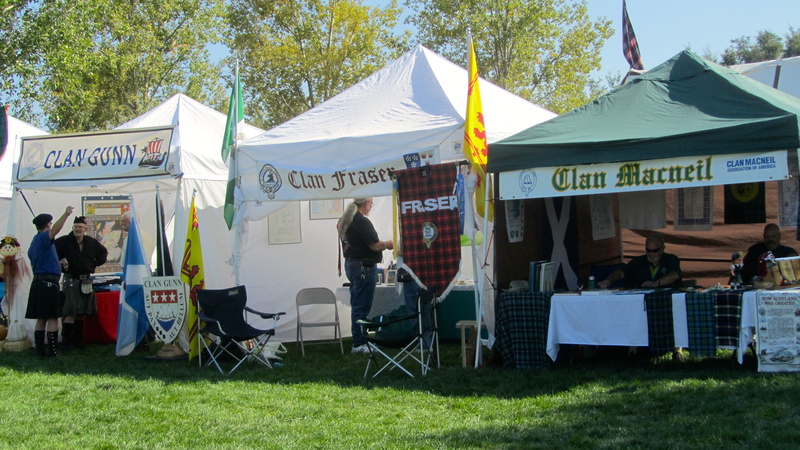 Many of the Celtic clans had booths at this festival. There was so much information! 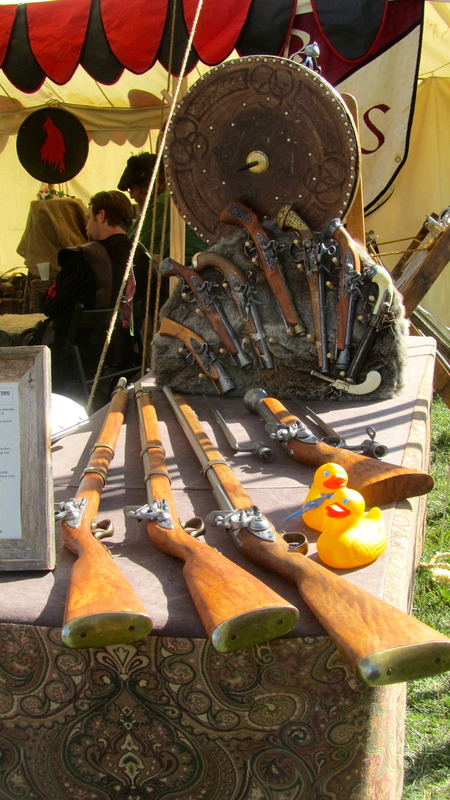 This booth showed weapons used many years ago. There are rifles, knives and amour. 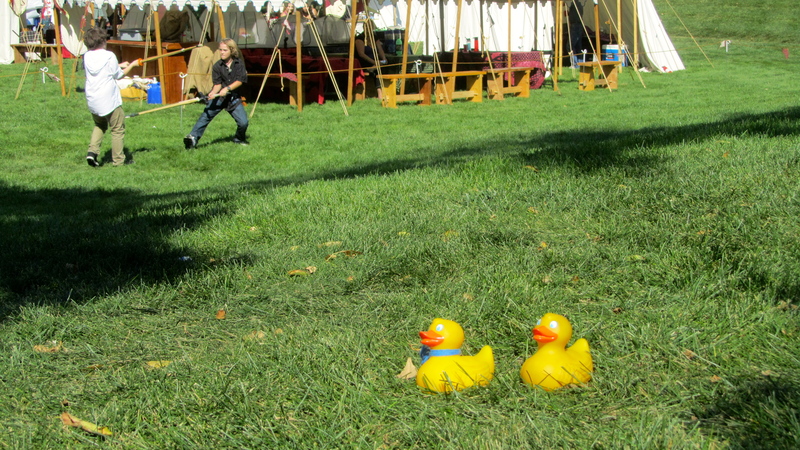 Humans could learn and practice sword fighting. 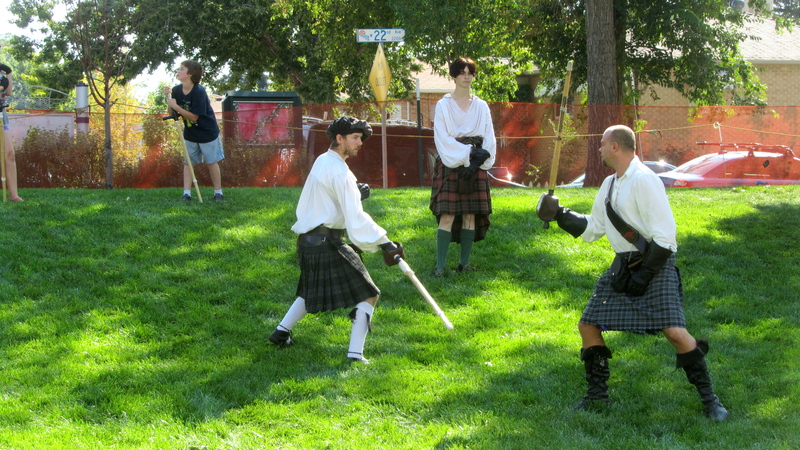 These people demonstrated how to correctly sword fight. 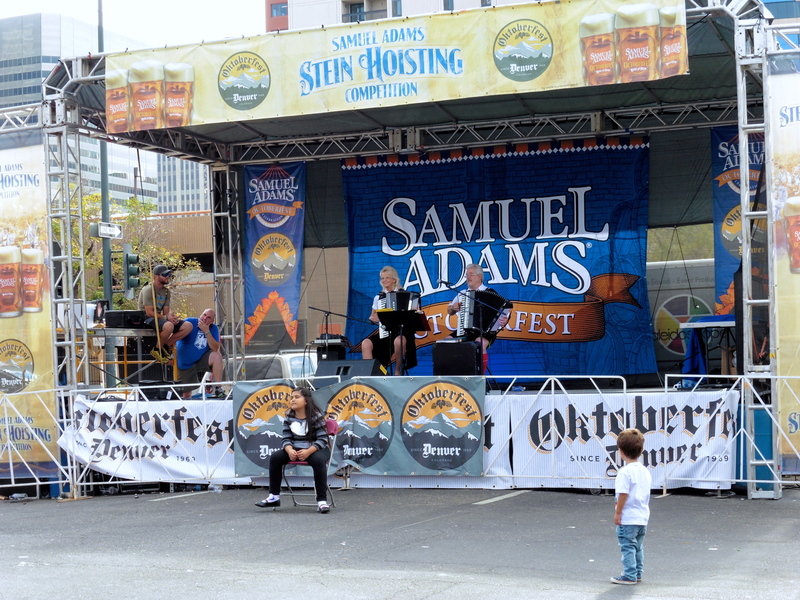 One stage had a sailor dance accompanied by a bagpipe. We felt so Celtic! 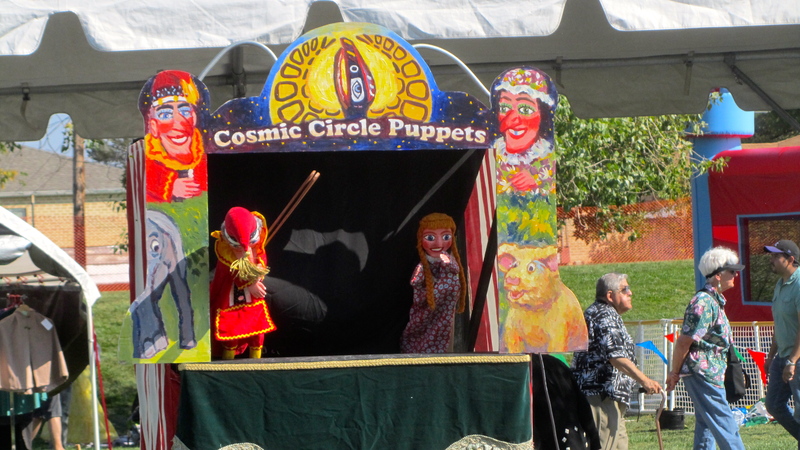 The puppet show was fun. 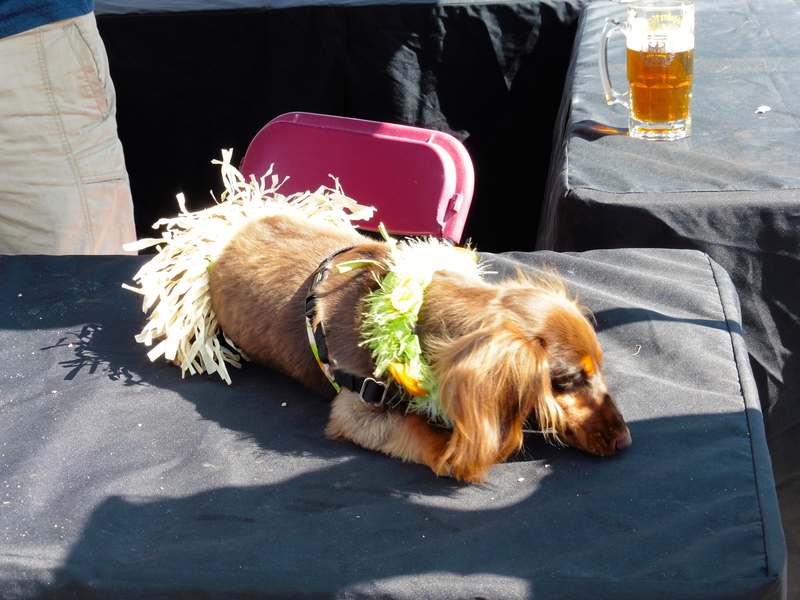 We like Celtic festivals. 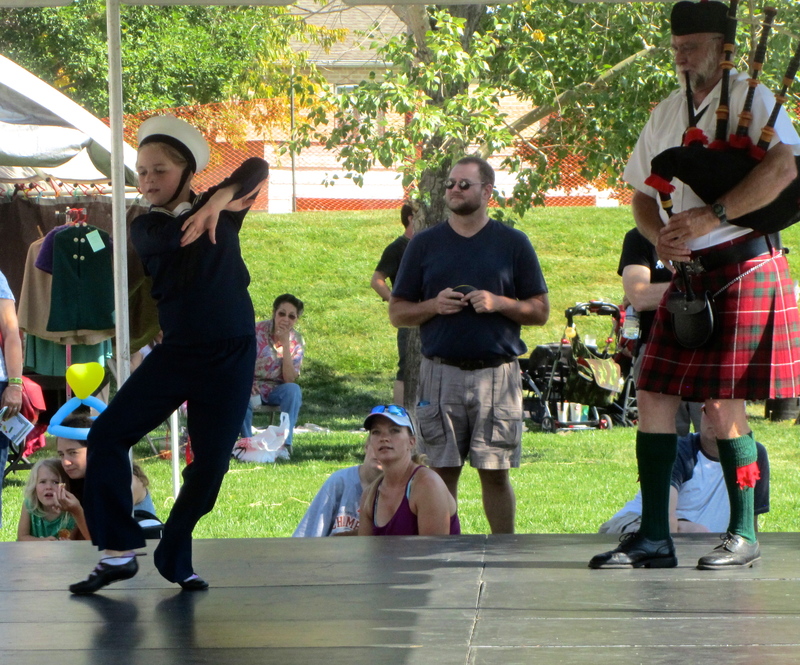 Soon another group of bagpipe players and dancers were ready to perform. we admired the merchandise for sale. 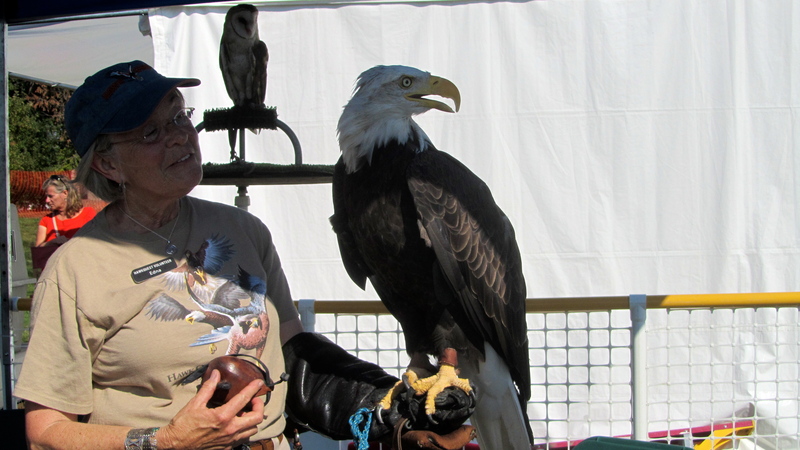 Then we found this American Bald Eagle and a barn owl from HawkQuest Raptor group. These raptors, or birds of prey, are beautiful birds and fabulous hunters. 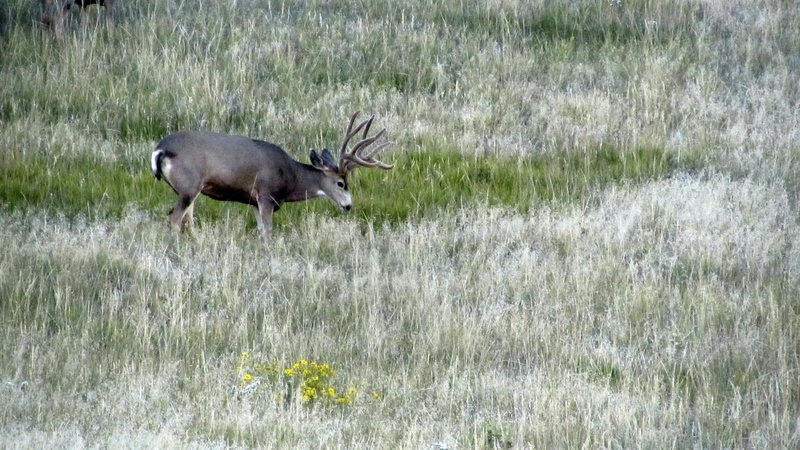 We were fortunate to see them so close. Zeb and Soapy were fortunate not to be prey for the raptors. 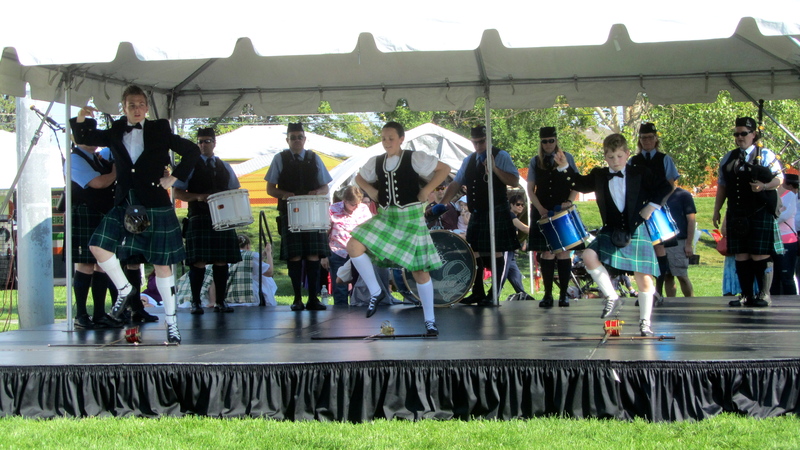 We hope you visit a Celtic Festival near you. 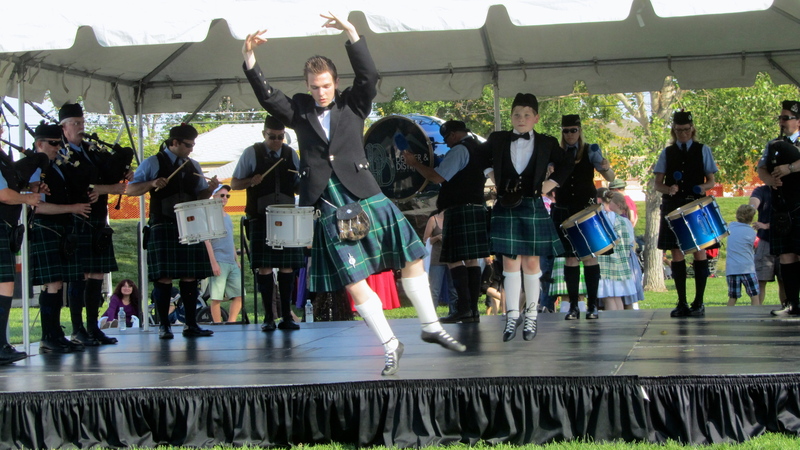 The bagpipes have a distinctive sound and the dancers are so agile and energetic. There was also a kid’s corner with inflatable entertainment. And, mom had another funnel cake. 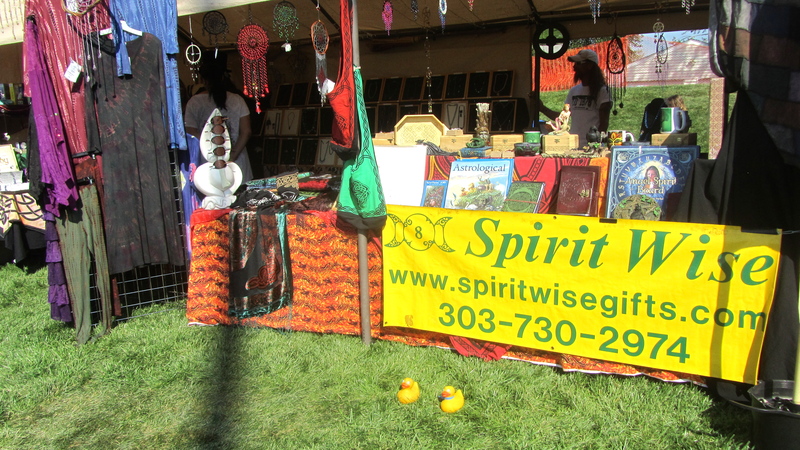 We hope to see you at a Celtic festival in the future. 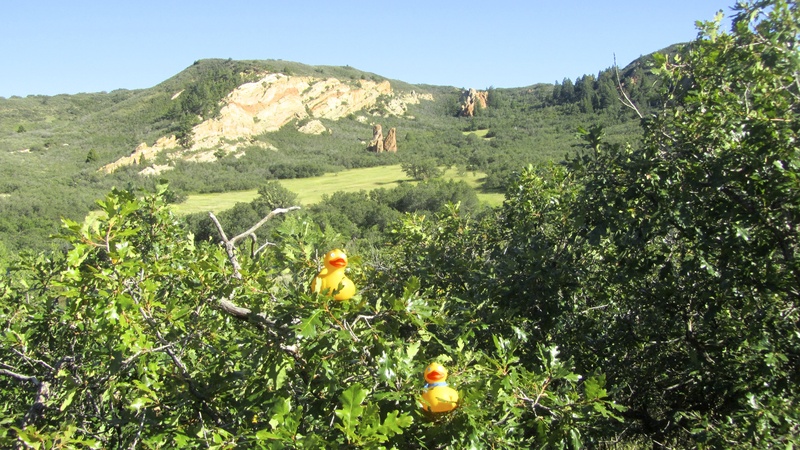 I, Zeb the Duck, went hiking with Soapy Smith Duck and mom. 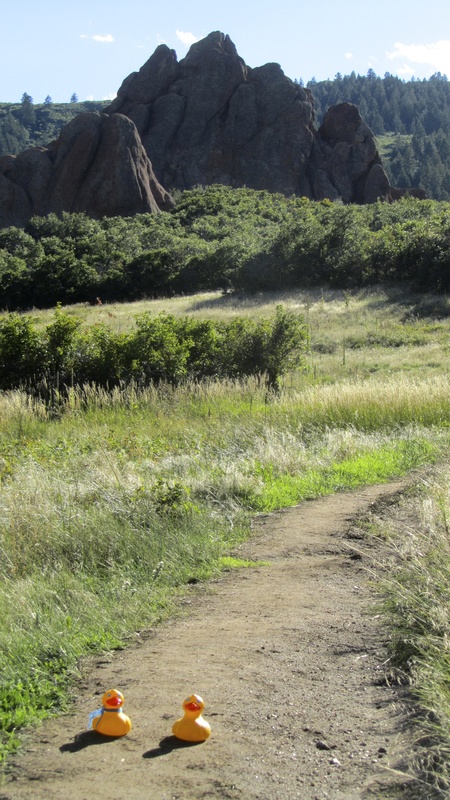 Roxborough State Park is 25 miles south of Denver and we loved it! Mom picked a trail and we started down the path. 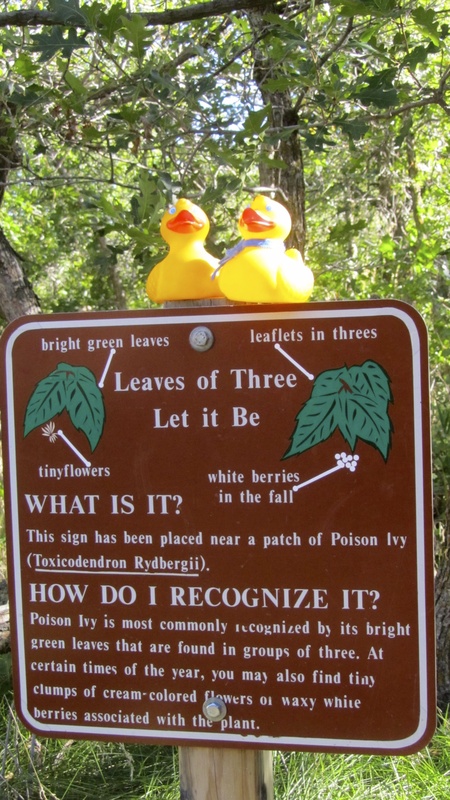 Then we saw this sign warning us about poison ivy. Be careful mom. We don’t want to spend a few days itching. We looked back at the Visitor’s Center. Great view of rock formations don’t you think? Our trail led us through a wooded area with many wild flowers. 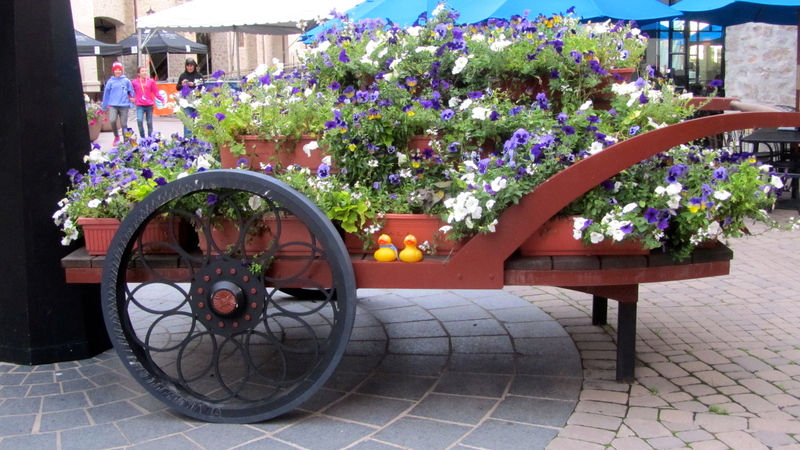 Of course we ducks think yellow flowers are the best color. An employee told us the wild flowers lasted longer this season because we had more rain this year. 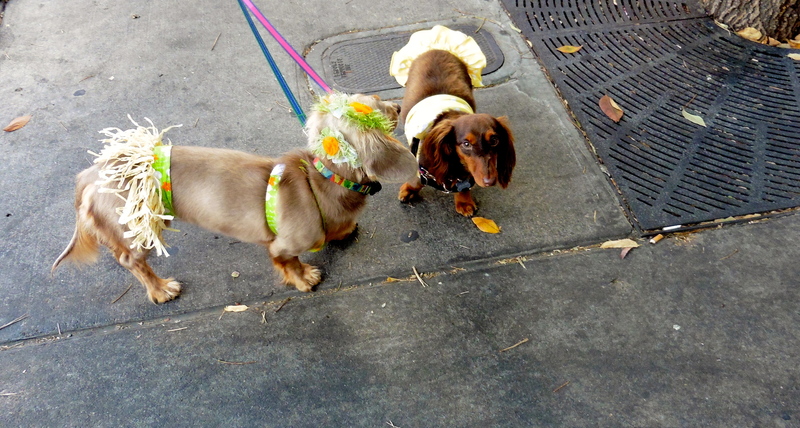 They are so pretty—we saw yellow, white, blue and purple flowers. At a break in the trees these rock formations came into view. WOW!! 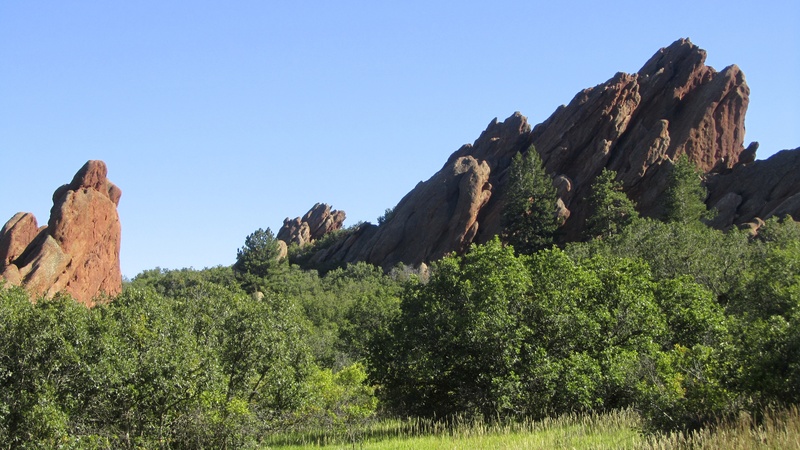 Roxborough State Park also has lighter colored rock formations. We could not pick a favorite. The trail had this bridge to cross the creek. 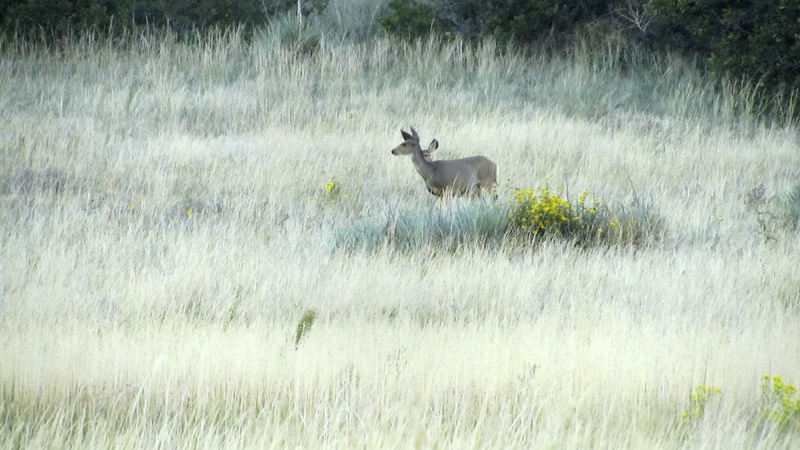 When we were driving away from the trails, this male was watching us. This lady has a young deer by her side. Mom is protecting her young. 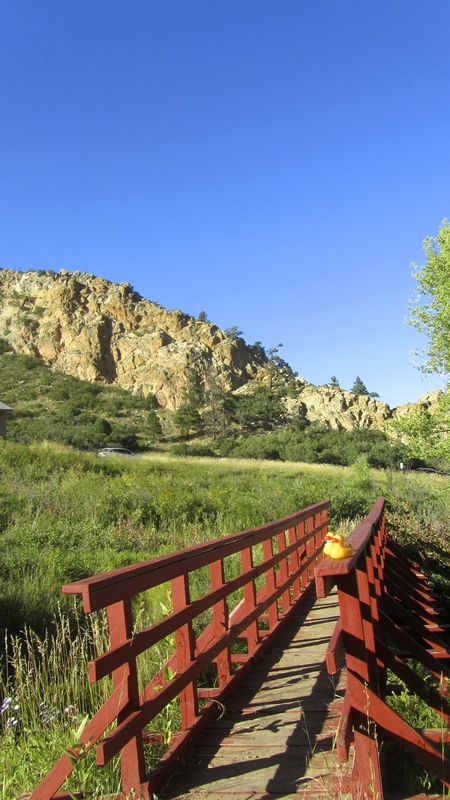 We all loved Roxborough State Park and we will be back for more hiking while admiring the beautiful scenery. 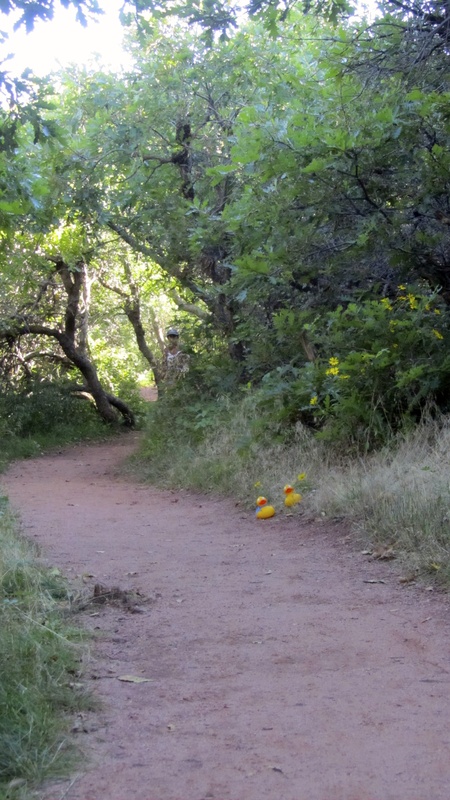 We would like to meet you on a trail here. Fossils are cool. 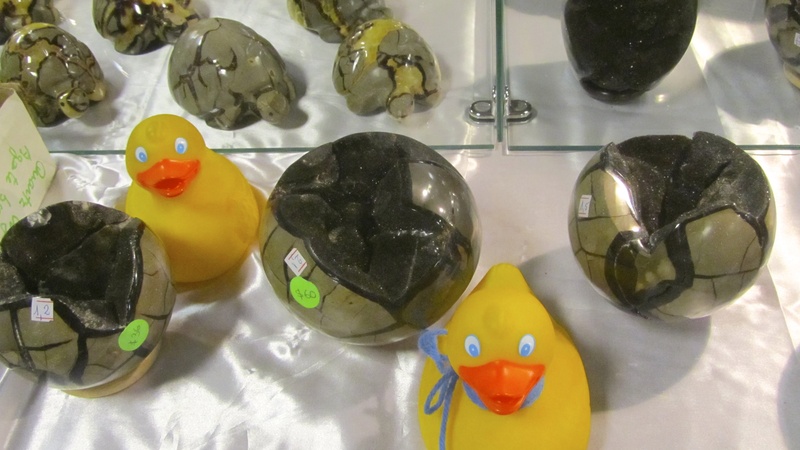 I, Zeb the Duck and Soapy Smith Duck went to the Mineral, Fossil and Gem Show at the Denver Coliseum. 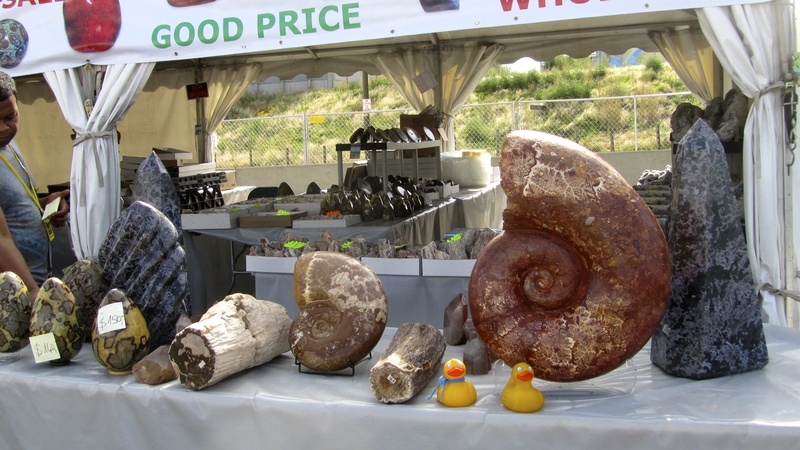 Before we entered the coliseum, we examined the offerings from Mineralphil Madagascar. These are fantastic. And look at the blue hues in the stones. The blue matches Soapy’s tie. 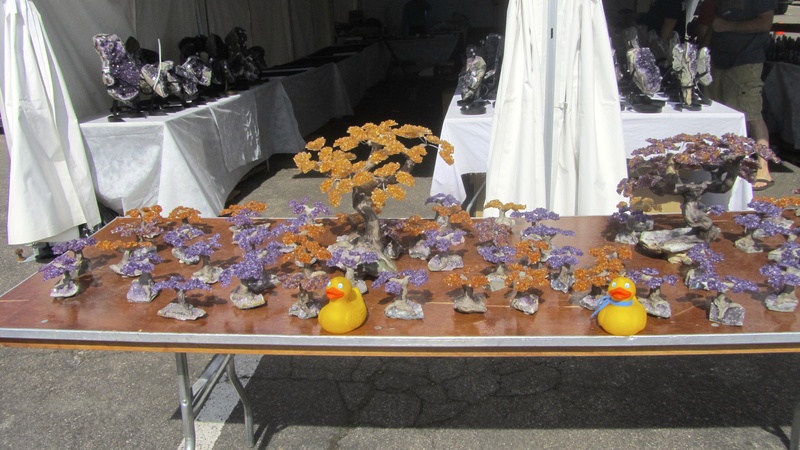 From Uruguay Amethyst we admired these trees and other sculptures. Just look at these fossils. 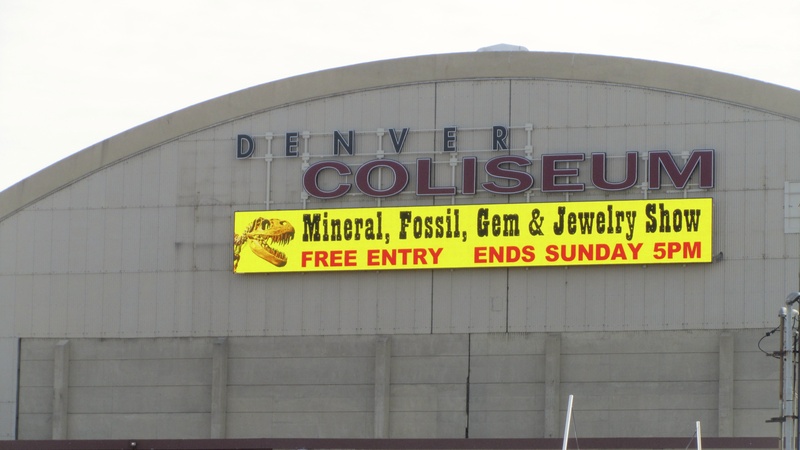 Entering the Denver Coliseum, we spotted these fossils from Fossilien Galerie. 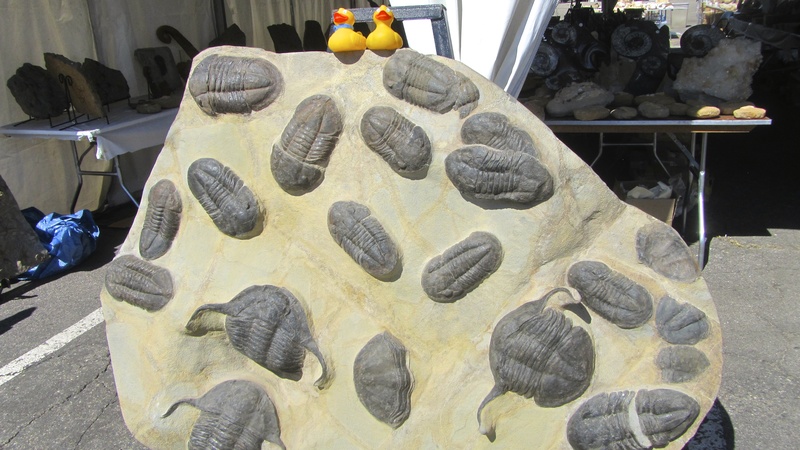 Fossils come in many sizes. Next mom admired some jewelry. She really loves the green malachite. The orange carnelian is beautiful. 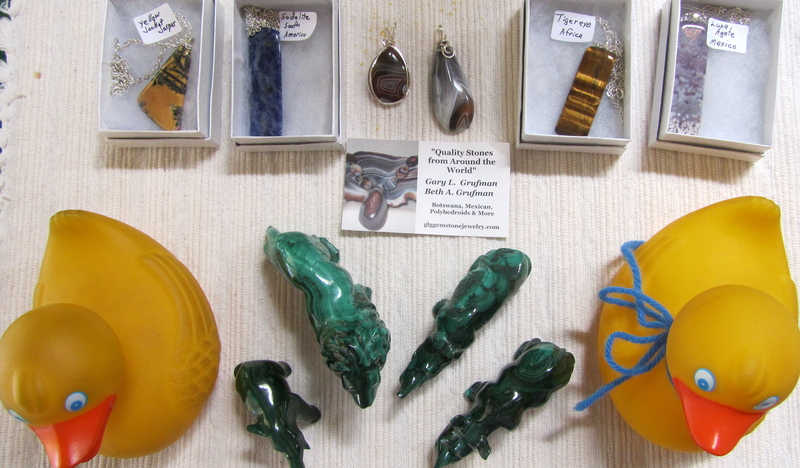 These were from GLG Gemstone Jewelry. Next we saw a ship. 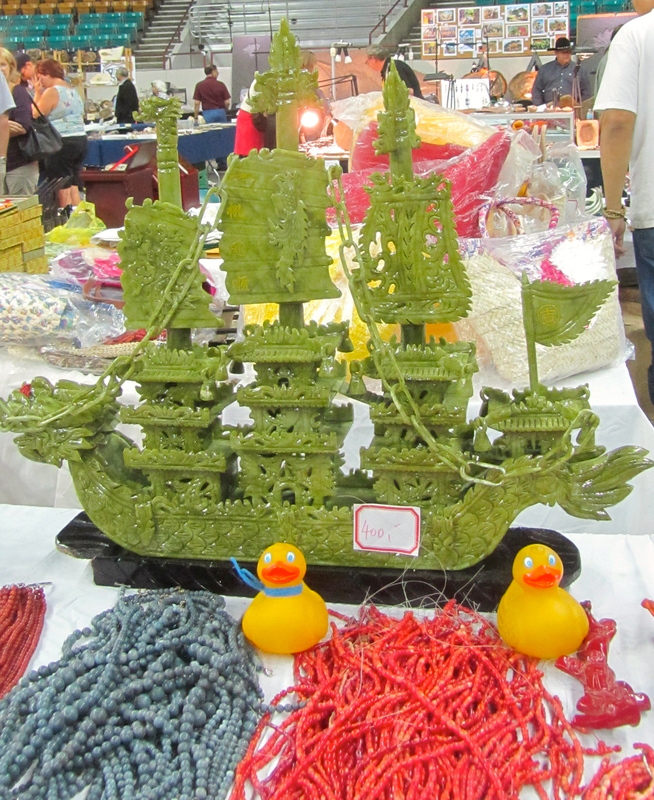 This ship is carved from jade. It is really big! Remember I told you mom really likes malachite? 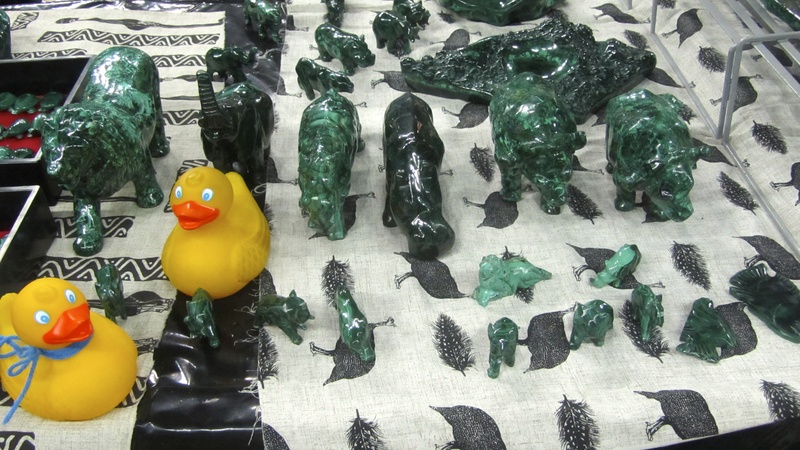 Here are malachite animals. As we wandered toward the exit, we discovered this septarian from Madagascar. 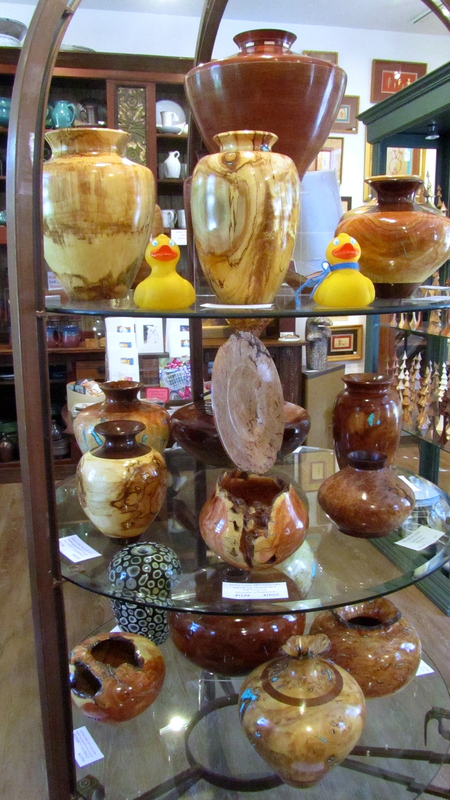 Some septarian is also found in Southern Utah. The geodes and the turtles were both incredible. 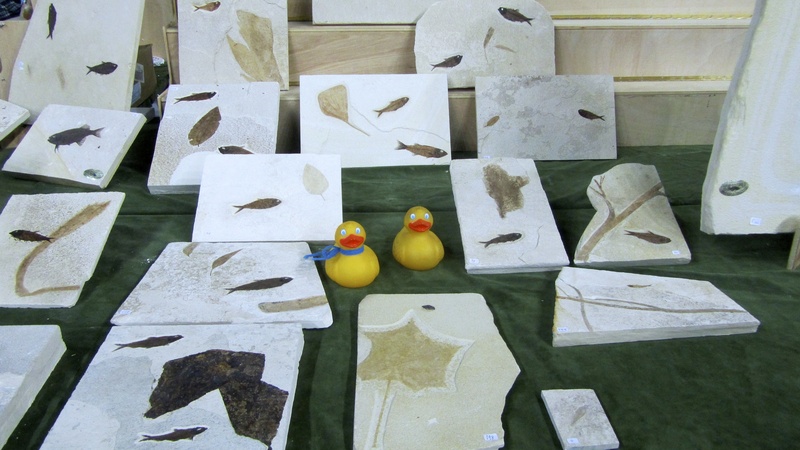 We really enjoyed seeing so much at the mineral, fossil and gem show. We went just to look. This is what came home with us. 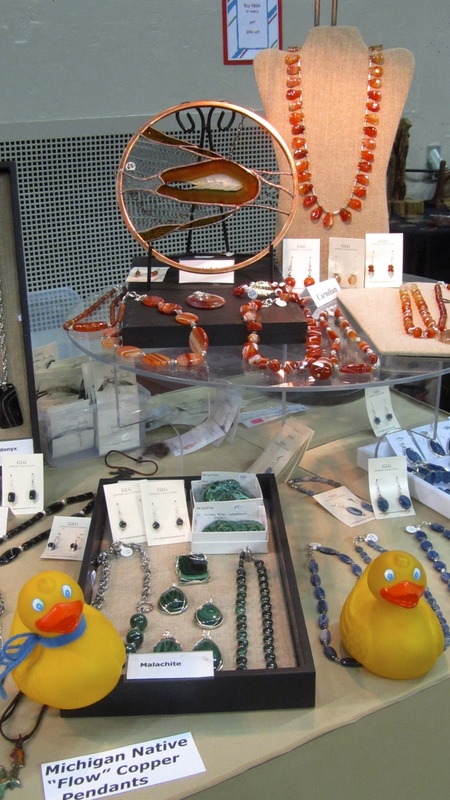 The two pendants without boxes are Botswana agates. Mom had never seen these before. There is always something new at these shows. 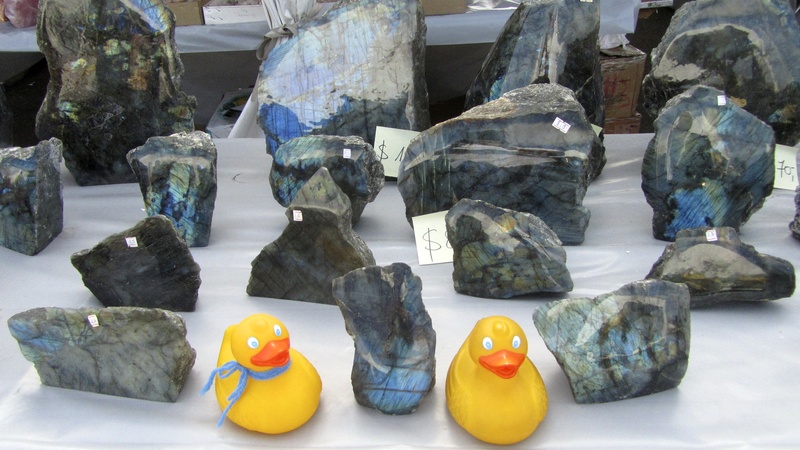 We hope you visit a mineral, fossil and gem show soon.